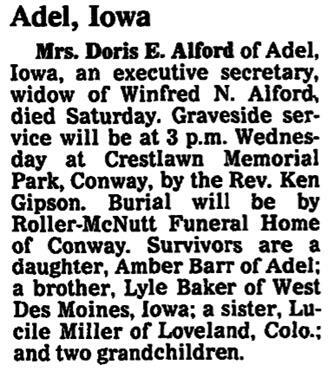 The families of many of the subjects of these Iowa obituaries are represented in AAFA Alford Genealogies published on this website, where we are referring readers for more information. Mrs. Ada Halford, 41, a resident of Buffalo, Ia., since 1930, died at the University Hospital in Iowa City at 9:30 p.m. Tuesday after an extended illness. Mrs. Halford was born in Ozark county, Mo., on Oct. 25, 1894, and received her education in the schools of that community. She married Bert F. Halford on Jan. 28, 1917. The family moved to Buffalo five years ago. Surviving beside the husband are four children, Lathea, Orel, Opal and Merle, all at home; her parents, Mr. and Mrs. Andrew Martin, Dora, Mo. ; eight sisters, Mrs. M.E. Sweeton, Mrs. Cloa Owens and Miss Alice Matins all of Dora, Mo. ; Mrs. Tennie Beasley, and Mrs. J.C. Doran, both of Fairview, Mo. ; Miss Angeline Martin, Lynnwood, Ia. ; Mrs. Myrtle Blair, Colfield. Mo. ; and Mrs. Bertha Cropper, Thomsville, Mo. ; two brothers, Gilbert Martin of Elijah, Mo. ; and Exerett Martin of Dora, Mo. The body was brought to the Runge mortuary and funeral services will be held at the Friend’s church in Buffalo Friday at 2 p m. with the burial in Rose Hill cemetery. 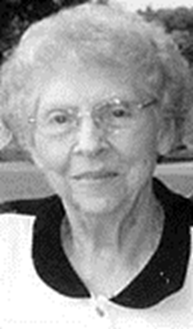 Anna Rasmussen Alvord, 86, of NBA-Ramsey Home died of a respiratory ailment there on Wednesday [February 20]. Services were held at Immanuel Lutheran Church in Kimballton [Audubon Co.]. Burial was at the church cemetery. Mrs. Alvord was born in Kimballton and had lived there as a youth. She had lived in Des Moines for 65 years. She was a homemaker and had attended St. John’s Lutheran Church. She is survived by a daughter, Chris Matchinsky and a sister, Fanny Rasmussen, both of Des Moines, five grandchildren, and five great-grandchildren. AAFA NOTES: SSDI records show that Anna C. Alvord (SS# issued in IA) was born 6 May 1916, last residence Des Moines, Polk Co., IA. See the obituary of her husband, William Paul Alvord, in this compilation. In 1920, Kimballton, Audubon Co., IA, Anna K Rasmussen, age 3-8/12 born IA, is living with her parents, Lars and Monika Rasmussen, both born Denmark, and 6 siblings, all born IA. From Iowa, County Births, 1880–1935 [FamilySearch.org]: Anna Rasmussen was born 6 May 1916 in Kimballton, Audubon Co., IA, parents Lars Rasmussen and Monika Henningsen. Anna’s parents are also buried in Immanuel Lutheran Cemetery. 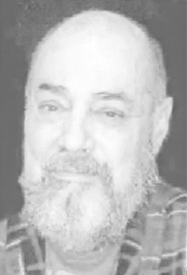 WINTHROP [Buchanan Co.], Iowa—Arnold Halford, 82, of Winthrop, died after a long illness Tuesday, Feb. 27, 2001, at home. Services will be at 11 a.m. Friday at St. Patrick’s Catholic Church, Winthrop…. Burial will be in Fairview Cemetery, Winthrop. Friends may call from 3 to 8 p.m. today at Fawcett Funeral Home, Winthrop. Surviving are his wife, Kathleen, of Winthrop; a son, Randy (Sally), of Waunakee, Wis.; five daughters, Judy Rae Halford, of Oskaloosa, Patricia (Craig) Cameron, of Independence, Colleen (Wayne) Venter, of Rochester, Minn., Glenda Greenhalgh, of Independence, and Dianne Halford, of Houston, Texas; nine grandchildren, Chad Huntington, Michele Roth, Katie Huntington, Clay Cameron, Clif Cameron, Nikki Barth, Erin Halford, Patrick Halford and Karlyn Westover; and a sister, Margie (Richard) Soules, of Stanley. 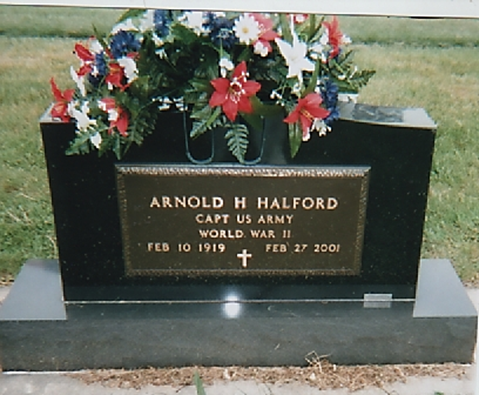 AAFA NOTES: SSDI records show that Arnold H. Halford (SS# issued in IA) was born 9 Feb 1919 [different than gravestone]. See the obituaries of his wife, Kathleen Mae Duggan Halford; and siblings Mildred Shirley Halford Freebern and Nelson Ralph Halford in this compilation. We included the obituaries of his paternal grandparents, Ashley Rozel Halford and Nancy Elizabeth Davis Halford, in Illinois Obituaries. His HALFORD lineage: Arnold Hayes 1919 IL1, Roy Ralph 1896 IL2, Ashley Rozel 1870 IL3, [Ashley’s father unknown; he used his mother’s last name] Mary Francis 1848 IL4, Jonathan Adkinson 1800 NC5, John 1765 NC6, James 1737 NC7, John 1690 NC8, John 1640 NC9, Thomas 1614 England10. 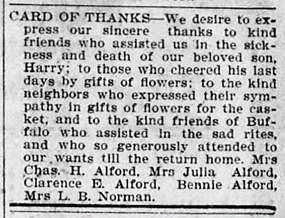 The many friends of Benjamin Boise [sic] Alford, 514 West Sixteenth street, well known throughout the tri-cities, will be grieved to hear of his death, which occurred last night at 11:20 o’clock at Mercy hospital, following an illness of but five days’ duration. Mr. Alford was operated on for appendicitis yesterday, but failed, however, to recover. He was born Sept. 30, 1889, In Worthington, Minn., coming to Davenport, where he had made a host of friends, when a small boy. He had been employed at the Bettendorf wheel works as a bookkeeper. On Sept. 30, 1910, he was united in marriage to Miss Olga Schrieber of this city, who survives together with a son, Vernon Weston, aged five months. In addition to these his mother, Mrs. Julia Alford, and a brother, Clarence E. Alford, both of Davenport, survive. Funeral announcements will be announced later. AAFA NOTES: See the obituaries of hisparents, Charles H. Alford and Julia Johnson Alford; and brothers Clarence E. Alford and Harry J. Alford in this compilation. We included the obituaries of his son Vernon Weston Alford in Florida Obituaries; and of his brother Alma W. Alford in Minnesota Obituaries. 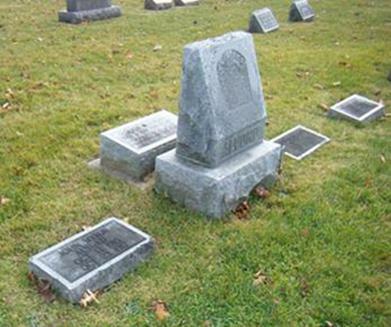 From IA Deaths: Benjamin Boise Alford, age 22, was born 30 Sept 1891[different than obituary and gravestone] in MN, son of Charles Alford and Julie Johnson. He died 12 March 1912 in Davenport, Scott Co., IA. His lineage: Benjamin Boise 1889 MN1, Charles H. 1849 IA2, William 1816 England3. 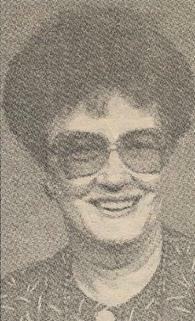 Bernice V. Alford, 87, formerly of Davenport, died Monday, Oct. 5, 1998, at Bettendorf [IA] Health Care Center, after a brief illness.... No services are planned. The body will be cremated. Runge Mortuary and Crematory, Davenport, is in charge of arrangements. Mrs. Alford worked 25 years at Charles Bruning Co., Chicago, before her retirement. Bernice Mach was born Nov. 19, 1910, to Frank and Mary Mach. She married James Alford in 1933 in Chicago. He died in 1975. She was an avid crossword puzzle worker and enjoyed her pets. Memorials may be made to the family. Survivors include a daughter, Mary Ellen Gill, Davenport; grand-daughters, Mrs. Janice Blanche, Eldridge, Iowa, and Judy Munday, North Platte, Neb. ; four great-grandchildren; and a great-great grandson. 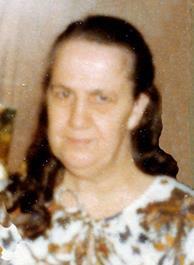 She was preceded in death by her grandson, James Frank Gill, on July 20, 1997. AAFA NOTES: SSDI records confirm the birth and death dates of Berenice V. Alford (SS# issued in IL). Betty Alford, 85, formerly of Windsor Heights, passed from this life on Saturday, October 7, 2006 at Fountain West Health Center in West Des Moines. A funeral mass will be held at 10 a.m. on Wednesday, October 11, at St. Theresa’s Catholic Church in Des Moines, of which she was a member. Burial will follow at Glendale Cemetery in Des Moines. Betty was born on May 3, 1921 in Kansas City, Missouri to Victor DePaul and Gertrude Vera (Howe) Mullin. She married Robert A. Alford on January 9, 1943 in Washington, D.C. and in 1958, they moved to Windsor Heights, where they made their home. Betty was a member of the Des Moines Golf and Country Club. She was an avid golfer and reader. Her congeniality and good wit will be greatly missed by all who knew and loved her. She is survived by her husband of 63 years, Robert Alford of West Des Moines; and a host of many friends. Betty was preceded in death by her parents. Visitation will be held from 5 to 7 p.m. on Tuesday, October 10, at Iles Funeral Homes – Westover Chapel in Des Moines, where a Vigil service will begin at 6:30 p.m. Memorials may be made to either St. Theresa’s Catholic Church or the American Diabetes Association. AAFA NOTES: SSDI records confirm the birth and death dates of Betty J. Alford (SS# issued in MO), last residence West Des Moines, Polk Co., IA. See the obituary of her husband, Robert A. Alford, in this compilation. It includes a photo of their shared gravestone. 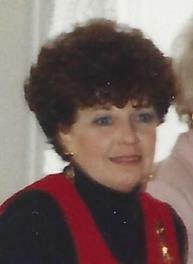 Betty Alford, West Des Moines—Graveside services were March 15 at Laurel Hill Cemetery. 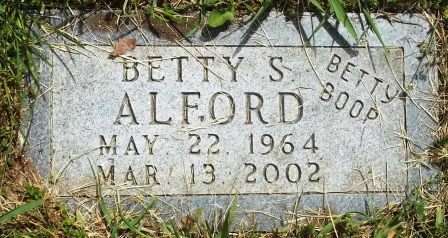 Betty Alford was born in Cincinnati, Ohio, and had lived in the Des Moines area most of her life. She was a telemarketer with Access Direct and enjoyed listening to music and dancing. She is survived by a daughter, Lindsey Alford of Des Moines; three sons, Donny Alford, Curtis Alford and Cash Alford, all of West Des Moines; five brothers, Jimmy Todd Sr. and Ronald Alford, both of Des Moines, Charles Alford of Keokuk, Earl Alford of West Des Moines and Donald Alford of Stuart; and two sisters, Shirley Stepp of Richmond, Ky., and Lillie Alford of Hills. Memorial contributions may be made to Hospice Kavanagh House. Hamilton’s Funeral Home of Des Moines handled the arrangements. AAFA NOTES: SSDI records show that Betty S. Alford (SS# issued in IA) was born 22 May 1965. See the obituaries of her parents, Mat Arthur Alford and Mae Stepp Alford; and her brothers Charles Everett Alford, Earl Clyde Alford, and Jerry D. Alford in this compilation. Her lineage: Betty 1964 OH1, Mat Arthur 1923 KY2, Charles 1892 KY3, Tarlton 1863 KY4, Daniel Lunsford 1830 NC5, John 1806 NC6, Achilles 1772 VA/NC7, John before 1750 VA8. Birdie Alford, 82, died at the Good Samaritan Home Friday evening, following a long illness. She had lived at the home about a year and a half. Mrs. Alford was born at Fort Worth, Tex., in.1871. She was married to Rufus Alford in Mississippi, where she lived until coming to Mason City in 1917. She was a member of St. John’s Baptist Church. A son, Fred, Laurel, Miss., survives. Funeral services will be held at 4 p.m. Monday at the McAuley and Son Chapel, with the Rev. G.M. Williams officiating. Interment will be at Elmwood Cemetery…. 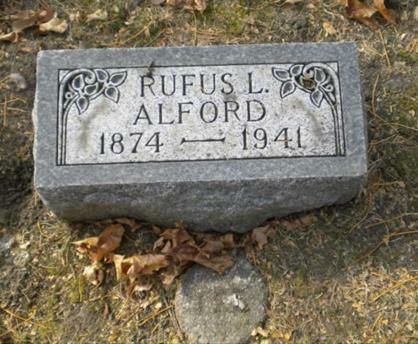 AAFA NOTES: See the obituary of her husband, Rufus L. Alford, in this compilation. Her Find A Grave memorial says she has no gravestone. Birt Franklin Halford, 76, R.R. No. 2, Walcott, died Thursday [June 18] in St. Luke’s Hospital after an extended illness. Services will be 2:30 p.m. Monday in the Runge Chapel. Burial will be in Rose Hill Cemetery, Buffalo…. Mr. Halford was born in Ozark, Mo. 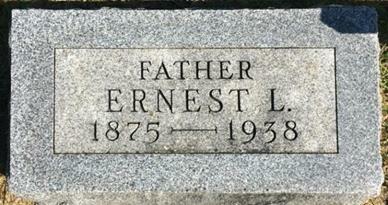 He married Ada Martin in 1916 at Dora, Mo. She preceded him in death. He married Celestia Hathcock Dec. 18, 1946, in Illinois. He has been employed at the Dewey Portland Cement Co., retiring in 1961. 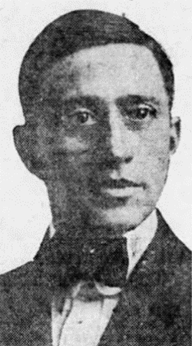 Mr. Halford is survived by his wife; daughters, Mrs. Bernard Huber, Cedar Rapids, Iowa; Mrs. Chester Brentise, Davenport; Wanda and Susan, at home; a stepdaughter, Mrs. Howard Carlson, Peoria, Ill.; sons, Orel, Bettendorf; Merle, Davenport; Gary, Stationed in California with the U.S. Marines, and Jerry, at home; stepsons, Winston Hathcock, Davenport; Vanton Hathcock, Fordland, Mo. ; 18 grandchildren; five great-grandchildren; and sisters, Mrs. Lucy Thornton, Mountain Grove, Mo. ; Mrs. John Hall, West Plaines, Mo., and Mrs. 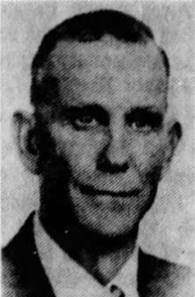 Gather Stout, Riverside, Calif.
AAFA NOTES: SSDI records show that Birt F. Halford (SS# issued in MO) was born 7 March 1894 and died 15 June 1970 [different than obituary], last residence Walcott, Scott Co., IA. See the obituaries of his first wife, Ada Harriett Martin Halford; his second wife, Lillie Celestia Easter Hathcock Halford; and children Merle Halford, Opal Marie Halford Huber, and Orel Lee “Whitey” Halford in this compilation. We included the obituary of his son Jerry Lester Halford in Missouri Obituaries. Extensive information on the Halford family, including photos of William Luker Halford and his wife, Susan Caroline Walker, can be found on the web page of Michael Kruse, The Kruse Home Page. His HALFORD lineage: Birt Franklin 1894 MO1, James Franklin 1858 TN2, William Luker 1835 TN3, John 1795 SC4. Blanche Marie Alford, 87, formerly of Mill Street, died Wednesday, January 28, 2004, at Mercy Hospital in Iowa City. Services will begin at 10 a.m. Monday, February 2, 2004, at Gill Chapel in Washington, Indiana, with the Rev. Tim Baxter officiating. Burial will be in Sugarland Memory Gardens. Friends may call from 4 to 8 p.m. Sunday. Mrs. Alford was born January 8, 1917, in Davies County, IN., to Frank Riester and Nellie McClellan. She was a 1935 graduate of Washington High School. She married Floyd Sam Alford on June 15, 1935. He died July 30, 1998. She had worked as a saleslady for J.C. Penney for 25 years. Survivors include two sons and their wives, Sam and Sharan Alford of Coralville and Scott and Debbie Alford of Whitney, Texas two grandsons and their wives, Steve and Tanya Alford of Iowa City and Sean and Kelley Alford of Carmel, IN and five great-grandchildren, Kory Alford, Bryce Alford, Kayla Alford, Joshua Alford and Jacob Alford. Blanche Marie Alford, 87, formerly of Mill Street, died at 12:25 a.m. Wednesday at Mercy Hospital, Iowa City, Iowa. 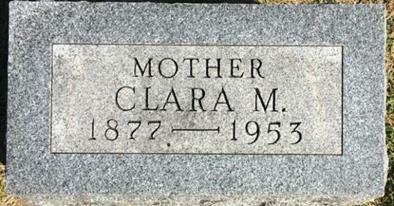 Born Jan. 8, 1917, in Daviess County, she was the daughter of Frank and Nellie (McClellan) Riester. A 1935 graduate of Washington High School, she retired from J.C. Penney after working 25 years as a saleslady. She was a member of First Baptist Church. She is survived by two sons and their wives, Sam and Sharan Alford of Cobalville, Iowa, and Scott and Debbie Alford of Whitney, Texas; two grandsons and their wives, Steve and Tanya Alford of Iowa City, Iowa, and Sean and Kelley Alford of Carmel; and great-grandchildren, Kory, Bryce, Kayla, Joshua and Jacob Alford. 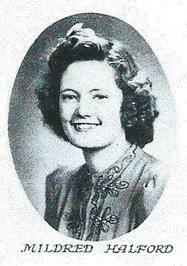 Her husband, Floyd Sam Alford, whom she married June 15, 1935, died July 30, 1998. One brother, Joe Riester, is also deceased. The funeral will be at 10 a.m. Monday at Gill Chapel…. Burial will be in Sugarland Memory Gardens…. Memorials may go to the Sam Alford Scholarship Fund or First Baptist Church. Sometimes we all need to take a time-out to step away and take care of what’s really important in life. Iowa coach Steve Alford did just that on Monday, when he bypassed the Hawkeyes’ afternoon practice to attend the funeral of his grandmother in Indiana. Blanche Alford, 83, passed away from a stroke on Jan. 28. She was the mother of Iowa’s director of basketball operations, Sam Alford, Steve’s father. Sam Alford has not been with the Hawkeyes for their past two games. Iowa assistant Greg Lansing, who filled in for the Iowa coach during Monday’s Big Ten teleconference, said his boss is a man who has his priorities well in order. AAFA NOTES: SSDI records confirm the birth and death dates of Blanche M. Alford (SS# issued in IN), last residence Iowa City, Johnson Co., IA. We included the obituary of her husband, Floyd M. “Sam” Alford, in Indiana Obituaries. Blanche is the grandmother of Steve Alford of basketball fame. 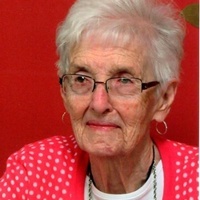 Services for Mrs. Catherine McCurnin of 214 Third Street Northeast, Mitchellville, will be 10:00 AM Wednesday at the Catholic Church of St. Joseph, East Thirty-third and Easton, Des Moines. Rosary 7:00 PM Tuesday at the Funeral Home in Mitchellville. Interment Mitchellville Cemetery. Moffitt Funeral Home. 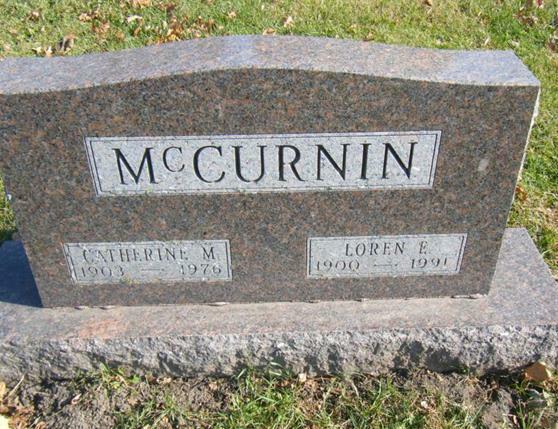 AAFA NOTES: SSDI records show that Catherine McCurnin (SS# issued in IA) was born 21 Apr 1903 and died _____ July 1976, last residence Mitchellville, Polk Co., IA. 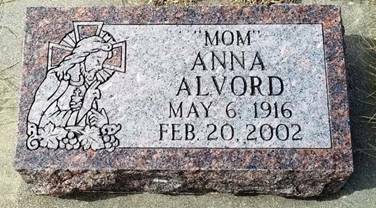 See the obituaries of her parents Harvey Clyde Alvord and Cornelia Ann DeVotie Alvord; and siblings Harry D. Alvord, Mary Esther Alvord King, and William Paul Alvord in this compilation. Her ALVORD lineage: Catherine M. 1903 IA1, Harvey Clyde 1879 IA2, William Brewster 1855 NY3, Sylvester Dudley 1810 NY4, Elijah 1774 CT5, Daniel 1742 CT6, Thomas 1710 MA7, Thomas 1683 MA8, Thomas 1653 CT9, Alexander 1627 England10, Thomas [ALFORD] 1598 England11. Charles E. Alford, age 63, of Marengo, died Thursday, April 23, 2015 at the Marengo Memorial Hospital. Funeral Service: 11:00 A.M. Monday, April 27, 2015, Kloster Funeral Home, Marengo with Pastor Eddie Thomas officiating. Burial will be in the Marengo Cemetery…. Charles is survived by his wife, Janice; four children, Jeannie Varela (Alfonso) of Marengo, Shirley Arends (Robert) of Marengo, Theresa Alford of Minneapolis, MN, and Charles Alford (Angel) of Marengo; sixteen grandchildren, Robert Ritter (Becca), Joshua Ritter, Melanie Ritter, Michelle Huston, Christopher Rose, Nickole Ritter, Destiney Huston, Sarah Rose, Samantha Rose, Charles Alford, Jr., Andrea Huston, Natalie Huston, Zoe Alford, Myia Alford, Gia Alford, Ricardo Malagon; and eleven great-grandchildren: Landyn Varela, Lachlan Ritter, Aydan Varela, Channing Alford, Jason Ritter, Brylee Stidham, Jaxon Aubrecht, Presliegh Moyer, Destinee Ritter, Cameron Brenneman, and David Ritter. Also surviving are his siblings, Jimmalee Todd (Brenda) of Des Moines, Donnie Alford (Chris) of Des Moines, Shirley Stepp (Vernon) of Kentucky, Lillie Alford of Kentucky, and Ronnie Alford of Des Moines. He was preceded in death by his parents, a daughter Brandy, two brothers, Jerry and Earl, and a sister Betty. 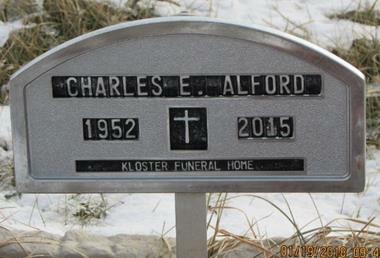 Charles Everett Alford was born February 20, 1952 in Dayton, Ohio, the son of Arthur and Nanny Stepp Alford. He and Janice Duncan Alford were married for 43 years. Charles was employed as a roofer and a handyman of various trades. He enjoyed cookouts with the family, camping, fishing, motorcycles, classic cars, and beer time. See the obituaries of his wife, Janice Marie Duncan Alford; parents, Mat Arthur Alford and Mae Stepp Alford; and siblings Betty S. Alford, Earl Clyde Alford, and Jerry D. Alford in this compilation. His lineage: Charles Everett 1952 OH1, Mat Arthur 1923 KY2, Charles 1892 KY3, Tarlton 1863 KY4, Daniel Lunsford 1830 NC5, John 1806 NC6, Achilles 1772 VA/NC7, John before 1750 VA8. Charles H. Alford, an old resident of Buffalo, and lately of Davenport, died at 5:45 Tuesday afternoon, from cancer of the stomach. 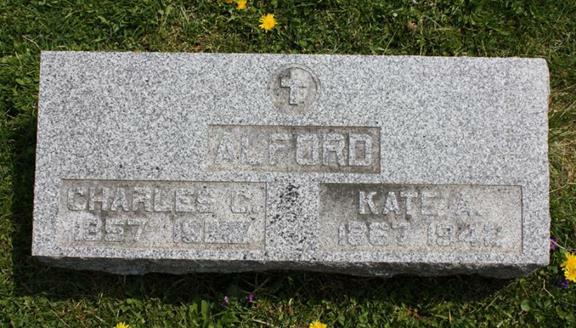 Mr. Alford was 56 years of age, and was born at Keokuk, Ia. In his early years his parents removed to Buffalo, where he spent about 30 years of his life, before the family removed to Worthington, Minn., 20 years ago. From there Mr. Alford came to Jamestown about three years ago, to take charge of the store of his half-brother, E.T. Langwith, which he ran until illness compelled him to quit. He leaves a wife and two sons, Clarence at Minneapolis and Ben at home. A brother, W.E. 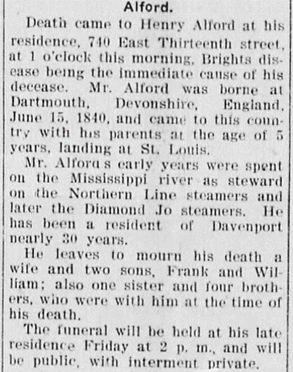 Alford, lives at St. Louis, and a half brother, H.J. Ladner, at Blue Grass, and half-sister, Mrs. F.E. Frank, on Henry street in this city, besides E.T. Langwith, a half-brother, living at 700 East High street. The funeral will be held at 1:30 Thursday afternoon, from the home, 514 West Sixteenth street. AAFA NOTES: See the obituaries of his wife, Julia Johnson Alford; sons, Benjamin Boise Alford, Clarence E. Alford, and Harry J. Alford; and mother, Eliza Jago Alford Langworth Ladner, and brothers Elisha D. Alford and Henry Alford in this compilation. We included the obituaries of his son Alma W. Alford in Minnesota Obituaries; and of his brother William E. Alford in Missouri Obituaries. His lineage: Charles H. 1849 IA1, William 1816 England2. Clara Alford, 74, of the 4000 block of Second Avenue, died of cancer Saturday at her home. Services will be at 9 a.m. Tuesday at Hamilton’s Funeral Home, with burial at Glendale Cemetery. Mrs. Alford was born in Wellman and had lived in Des Moines most of her life. She had been a homemaker. Survivors include two sons, Donald and Kevin, both of Des Moines; two daughters, Robyn Munday and Kelli Dockstader, both of Des Moines; two brothers, Ralph Fuller Jr. of Brownsville, Texas, and Donald Fuller of Arizona; four sisters, Evelyn Rickliff of Truro, Alice Kemp of Wellman, and Fern Rich and Eileen Blades, both of Des Moines; nine grandchildren; and six great-grandchildren. She was preceded in death by her husband, Donald…. See the obituary of her husband, Donald Hudson Alford, in this compilation. It includes a photo of their shared gravestone. Stricken with a heart attack while at his desk in the P.R.&T. railroad yard in West Davenport Monday afternoon, Clarence E. Alford died at 5:20 p.m. Monday [February 2] at the home of his mother, Mrs. Julia Alford, 526 West Sixteenth street. The attack occurred at 2 o’clock. The stricken man was taken to his mother’s home where he was attended by Dr. J.D. Cantwell. Mr. Alford was a telegraph operator in the west end yard of the P.R.&T. Railway Co., a position he had occupied for the last 25 years. He was a member of many local organizations and was widely known thruout the city. He was born in Buffalo, Ia., June 16, 1875. He received his education in the schools of Worthington, Minn., where he went to live as a child. He came to Davenport in 1903. Before coming here he was employed by the, C. St. P., M.&O. Railway Co., at Omaha. He was a member of St. Paul’s Lutheran church, Davenport lodge No. 37, A.F.&A.M., Mohassan Grotto No. 22, the Order of Railway Telegraphers, and the Good Fellows organization. He is survived by his mother, Mrs. Julia Alford and one daughter, Mrs. Romelle Fay, of Chicago. The body was taken to Runge’s mortuary. Funeral arrangements will be announced later. AAFA NOTES: See the obituaries of his parents, Charles H. Alford and Julia Johnson Alford; and brothers Benjamin Boise Alford and Harry J. Alford in this compilation. 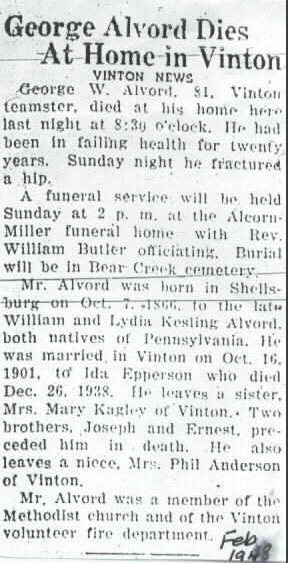 We included the obituary of his brother Alma W. Alford in Minnesota Obituaries. 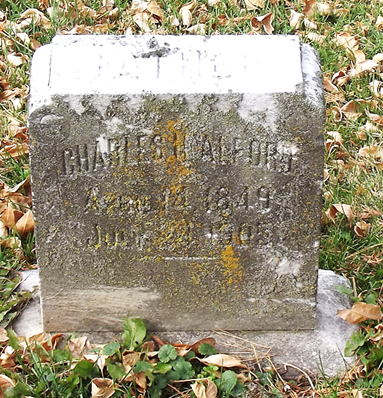 From IA Deaths: Clarence E. Alford was born 16 June 1875 in Buffalo, IA, son of Charles H. Alford and Julia Johnson. He died 2 Feb 1931 in Davenport, Scott Co., IA. His lineage: Clarence E. 1875 IA1, Charles H. 1849 IA2, William 1816 England3. Cornelia A. DeVotie, was born at Mitchellville, Iowa, July 6, 1878, and died at Mercy Hospital, Des Moines, Iowa, April 10, 1925, age 46 years, nine months and 4 days. 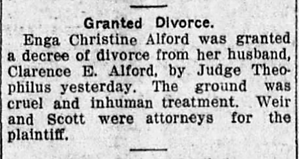 She was married to H.C. Alvord April 6, 1903. To this union were born seven children, Catherine, Robert, Mary, Vernon, Harry and Paul. John died at the age of two years. The funeral was held Sunday afternoon at 2:30, at the Methodist church, of which she was a member. The service was conducted by Rev. E.S. MacCartney of Prairie City, Iowa. Interment in the Mitchellville cemetery. AAFA NOTES: See the obituaries of her husband, Harvey Clyde Alvord; and children Catherine M. Alvord McCurnin, Harry D. Alvord, Mary Esther Alvord King, and William Paul Alvord in this compilation. Cornelia was the daughter of Perry D. DeVotie and Cornelia Ann Marshall. David Jon Alvord, 61, of the 2800 block of Claiborne Circle, Urbandale, died of cancer Wednesday [May 15] at Mercy Medical Center. Services will be at 9 a.m. Saturday at Wakonda Christian Church. Cremation will follow services. Mr. Alvord was born in Des Moines and had lived in the area most of his life. He was a bureau chief of planning, research and evaluation with the Iowa Department of Education and had been a vice principal at Park Avenue Elementary School. He is survived by his wife, Kay [listed as Glee but corrected in a corrected obituary published May 18] and two brothers, Mark of Ankeny and Gary of Des Moines. The family will receive friends from 6 to 8 p.m. today at Highland Park Funeral Home. Memorial contributions may be made to the American Cancer Society-Multiple Myeloma Foundation. AAFA NOTES: SSDI records show that David J. Alvord (SS# issued in IA) was born 1 Nov 1940, last residence not listed. See the obituaries of his parents, Harry D. Alvord and Thelma Irene Bennett Alvord, in this compilation. His ALVORD lineage: David Jon 1940 IA1, Harry D. 1910 IA2, Harvey Clyde 1879 IA3, William Brewster 1855 NY4, Sylvester Dudley 1810 NY5, Elijah 1774 CT6, Daniel 1742 CT7, Thomas 1710 MA8, Thomas 1683 MA9, Thomas 1653 CT10, Alexander 1627 England11, Thomas [ALFORD] 1598 England12. Services for Donald H. Alford, 55, of 4270 N.E. Twenty-eighth St. will be at 1:30 p.m. Wednesday at Hamilton’s Funeral Home, with burial in Glendale Cemetery. Mr. Alford died Sunday [April 24] at Iowa Methodist Medical Center of complications from a fall he suffered while unloading a truck in Cedar Rapids on Apr. 12. A truck driver for Pulley Freight Lines, Inc., Mr. Alford was born in Buffalo [Dallas Co.], Mo. He lived in Newton before coming to Des Moines 36 years ago. He was a member of the Teamsters Union Local 147 and the East Side Church of the Nazarene. Surviving are his wife, Clara; two daughters, Robyn and Kelli, both at home; two sons, Kevin and Donald, both at home; four sisters, Mrs. Doris Edwards and Mrs. Pauline Tabor, both of Newton, and Mrs. Louise Dawson and Mrs. Lois Timmons, both of Prairie City, two brothers, Wayne of West Des Moines, and Clint, jr., living in Oklahoma; his parents, Mr. and Mrs. Clint Alford of Newton, and two grandchildren. AAFA NOTES: SSDI records show that Donald Alford (SS# issued in IA) was born 5 Jan 1922 and died _____ Apr 1977, last residence not listed. We included the obituary of his brother Clinton Wallas Alford Jr. in Missouri Obituaries. His middle name is from his Find A Grave memorial. His father signed his name Clint Wallas Alford on his WWI Draft Registration Card. On the 1925 Iowa State Census, Donald H. Alford is age 3, born in MO. For more information about this family, see AAFA’s published genealogy, Known Descendants of John Alford and Jane McElhattan. His lineage: Donald Hudson 1922 MO1, Clinton Wallas 1895 MO2, Thomas Richard 1858 MO3, John M. 1821 TN4, John 1786 NC/TN5. WEST DES MOINES—Earl Alford, 53, passed away unexpectedly at his home Wednesday, April 15, 2009. Funeral services will be held at 1 p.m. Monday, April 20, 2009, at Hamilton’s Funeral Home, 605 Lyon St. with burial to follow at Laurel Hill Cemetery. Earl is survived by his loving wife of 31 years, Monica; children, Jennifer, Heather, Jacob and James; nine grandchildren; brothers, Jimlee Todd, Charles, Ronnie and Donnie Alford; sisters, Shirley Stepp and Lillie Alford; his very dear nephew, Curtis, as well as numerous other nieces and nephews. He was preceded in death by his parents, Matt and Mae Alford; and his siblings, Jerry and Betty Alford…. AAFA NOTES: SSDI records show that Earl C. Alford (SS# issued in IA) was born 20 May 1955, last residence not listed. See the obituaries of his parents, Mat Arthur Alford and Mae Stepp Alford; and his siblings Betty S. Alford, Charles Everett Alford, and Jerry D. Alford in this compilation. His daughter Jennifer posted the Alford/Jackson/Robertson Family Tree to Ancestry, where Earl’s middle name and birth data are included. His lineage: Earl Clyde1955 OH1, Mat Arthur 1923 KY2, Charles 1892 KY3, Tarlton 1863 KY4, Daniel Lunsford 1830 NC5, John 1806 NC6, Achilles 1772 VA/NC7, John before 1750 VA8. BUFFALO, Iowa, March 14, 1888—Tuesday, Mr. E.D. 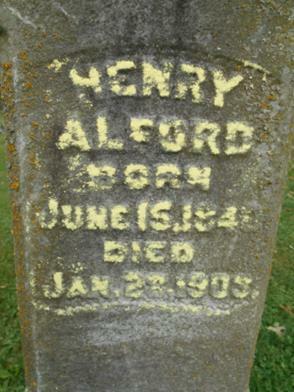 Alford who died at 8 o’clock Sunday evening from erysipelas of the arm, caused by bruising the skin on the left hand some three weeks ago to-day while at work on his farm in Keokuk county, and catching cold in the injured part, was borne by a host of loving relatives and friends to his cold tomb in the Buffalo cemetery. The deceased was born at Nauvoo, Ill. January 26, 1846, and was consequently only forty-two years old, just in his prime. From his youth up he was industrious, honest, and economical, laying up about $30,000. He came with his widowed mother to Buffalo in 1856 and at once began to earn, not only enough to provide for his own wants, but to help a noble mother to battle against the misfortunes of this life. All his spare earnings for years were gladly carried to his good mother. He was always determined not to be a burden to her, who was so kind and just to him. In the winter he would work continually, even though he made only his expenses. When he was about fifteen years old, he commenced wheeling coal at the mouth of Pine Creek, Muscatine county, at 50 cents per day. This he did in the winter and in the summer he ran on the Mississippi river as porter. As he grew older he became more ambitious, and we find him digging coal at the Cross Roads in the winter and when navigation was closed and working on steamers as stewart the remainder of the year. For some twelve years he continued to do this. Some eighteen years ago, he put some $2,000 into groceries and dry goods and opened a store at the Cross Roads back of here. The miners patronized him liberally, for when they had no money he let them have what they wanted, very seldom losing much. About five years ago, he sold out to his half-brother Mr. Edward Langwith, and he went to Ollie, this state, opening a general stone and lumber yard. He also bought grain and live stock. He soon became one of the wealthiest men in that neighborhood, having the confidence of all that dealt with him. He was successful in nearly every business transaction. In his dealings he made no fuss, but did his work manly and very quietly. He made a confident of no one, except, probably, Mr. E. Langwith. In August last he went to England, returning on the 18th of November, to be at the bedside of his dying mother, Mrs. Edward Ladner…. AAFA NOTES: See the obituaries of his mother, Eliza Jago Alford Langworth Ladner, and brothers Charles H. Alford and Henry Alford in this compilation. We included the obituary of his brother William E. Alford in Missouri Obituaries. His lineage: Elisha D. 1846 IL1, William 1816 England2. There is much grief in Buffalo over the death of Mrs. Edward Ladner, who has been a resident of the town more than 30 years. Mrs. Ladner’s life was attended with interesting features. Her maiden name was Eliza Jago. 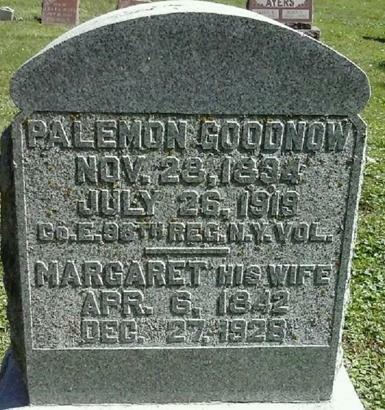 She was born in Dartmouth, Eng., June 16, 1822. April 23, 1839, she and William Alvord [sic] were united in marriage, Mr. Alvord being a prosperous ship builder. In 1845 they sailed for America, landing at New Orleans, January 15. Thence they removed to Nauvoo, Ill., where they remained one year, uniting with the church of the Latter-Day Saints. After spending a short time in Montrose, Iowa, they settled in St. Louis, where Mr. Alvord formed a partnership with Mr. Van Zandt, for the purpose of building steam vessels. Among the many boats this firm launched were the Martha Jewett, Lucy Bertram, and Highland Mary. 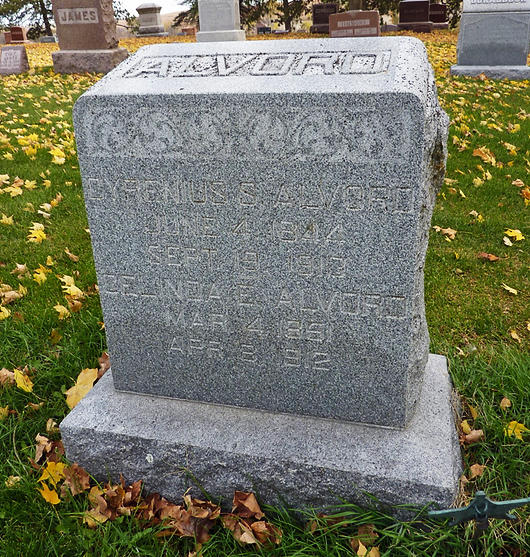 Mr. Alvord died of cholera in 1852. The following sons survive that union: Henry in Davenport, Elisha of Buffalo and just returned from a trip to England, Charles in Minnesota, and William and John in St. Louis. At St. Louis in 1854, Mrs. Alvord and William E. Langworth were married. They settled in Buffalo about 31 years ago. Edward Langworth of the Cross Roads and Frances Frank of this place are children of this marriage. In a few years Mrs. Langworth was again widowed. On the second day of January, 1864, Mrs. Langworth and Edward Ladner of Buffalo were married. This union was blessed with a son, Hampton, who has just attained his majority. Mrs. Ladner was deeply respected in the town an excellent wife, one of the best of mothers, and a very kind neighbor. The funeral occurred to-day. The public school was closed, the Lodge of United Workmen, of which Mr. Ladner was a member, attended in a body, and a large congregation of townspeople were present…. AAFA NOTES: See the obituaries of her sons Charles H. Alford, Elisha D. Alford, and Henry Alford in this compilation. We included the obituary of her son William E. Alford in Missouri Obituaries. CHEROKEE, Ia., Dec. 21 (AP)—E.L. Halford, 63, Cherokee contractor, died at his home today of heart disease. Mrs. Halford’s son and family, Dr. and Mrs. Francis J. Halford, arrived from Honolulu, Hawaii, Monday to spend the Christmas season. Another son, Ernest, jr., was notified at Honolulu. The widow, a son, Harold J. Halford, and Mrs. George Perrin, a daughter, all of Cherokee, also survive. AAFA NOTES: We included the obituary of his son Francis John Halford in Hawaii Obituaries. 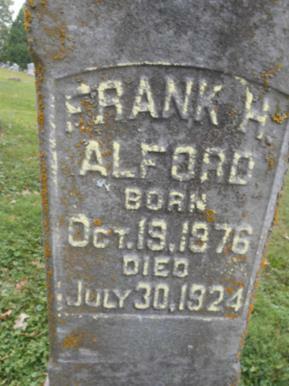 From Iowa, Marriage Records, 1880–1940 (Ancestry): Earnest Leonard Halford, age 24 born Hamilton Canada, son of John Halford and Clara Keatley, married Clara May Smith, age 22 born in Sac Co., IA, daughter of Thos. Smith and Margaret Chambers, on 24 May 1899 in Cherokee Co., IA. On Ernest Lenard Halford’s 1918 WWI Draft Registration Card (Ancestry), he is age 42, born 14 Dec 1875, living in Cherokee, Cherokee Co., IA. He is a self-employed barber and names his nearest relative Clara May Halford. He signed his name Ernest Lenard Halford. In 1900, Cherokee, Cherokee Co., IA: Ernest L. Halford, age 23 born Nov 1876 in Canada, parents born England; his wife Clara M. age 22 born IA; and son Harold 4 months born IA. On other censuses Ernest’s birth place is listed as IL. Funeral services for Esme V. Alford were held Wednesday, July 26, 1967 at 10:00 A. M. at the Presbyterian Church, with the Rev. Nadim Saikaly officiating, interment was in Arlington Cemetery, with Sutphen Funeral Home in charge. 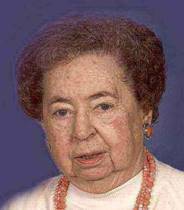 Esme V. Alford was born on August 8, 1890 in Denver Colorado, to J.H. and Ida Anderson. With her parents, she moved to the Villisca, Iowa area, where they made their home. She graduated from the Villisca High School in 1911; and from Grinnell College in 1916. She spent two years in China as missionary under the Board of Foreign Missions of the Congregational Church, and worked several years in Michigan and Washington D.C. In 1941 she was united in marriage to Ira Alford of rural Villisca. Her husband died in March 1946. She moved from her parents farm, and lived in Villisca, Iowa till her death. AAFA NOTES: SSDI records confirm the birth and death (_____ July 1967) dates of Esme Alford (SS# issued in IA), last residence Villisca, Montgomery Co., IA. See the obituary of her husband, Ira Joseph Alford, in this compilation. She was the daughter of James Henry Anderson and Ida D. Dunn. Esther M. Halford, 78, of rural Winthrop [Buchanan Co.], died Tuesday, Nov. 27, 2001, in Peoples Memorial Long Term Care Center, Independence, after a long illness. Services: 1:30 p.m. Friday, Union Church, Quasqueton. Burial: Circle Grove Cemetery, Walker. Friends may call after 2 p.m. Thursday and 9 to 11 a.m. Friday at Reiff Funeral Home, Quasqueton, and after noon Friday at the church. Survivors include a daughter, Rena Saunders of Le Claire; three sons, Gail Thompson of Independence, Edwin Thompson of Winthrop and Norman Thompson of Cedar Rapids; and a brother, Harold Floyd of Cedar Rapids. Also surviving are 11 grandchildren and 17 great-grandchildren. Esther M. Halford, 78, of rural Winthrop, Iowa, died Tuesday, November 27, 2001, at People’s Memorial Long Term Care Center in Independence following a long illness. Esther was born on May 26, 1923, near Vinton, Iowa, the daughter of Dallas D. and Lena L. (Ferguson) Floyd. She received her education in country schools in the Urbana area, and the Brandon High School in Brandon, Iowa. On October 5, 1941, she was united into marriage to Delvin Morris, and the couple made their home near Center Point, Iowa. The couple later divorced. 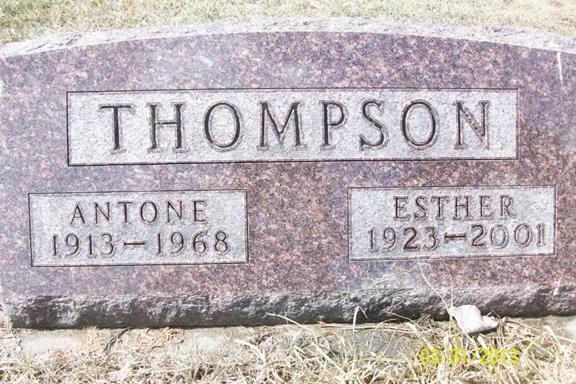 On November 1, 1947, she was married to Antone Thompson in the Little Brown Church in Nashua, Iowa. The couple farmed in the Winthrop area. Antone died in 1968. On April 29, 1976, Esther was married to Nelson Ralph Halford, and the couple continued to farm near Winthrop until Nelson died December 22, 1988. Esther was a member of the Union Church in Quasqueton, Iowa, The Ladies Aid, Kings Daughters, the Quasqueton Area Historical Society, and the G.B.A.Surviving is a daughter, Rena (Harold) Sanders of LeClaire; three sons, Gail (Dixie) Thompson, Independence, Iowa, Edwin (Judith) Thompson, Winthrop, Iowa, Norman (Lila) Thompson, Cedar Rapids, Iowa; 11 grandchildren, and 17 great-grandchildren; and one brother, Harold Floyd of Cedar Rapids, Iowa. Also surviving is a special friend Dale Kress of Quasqueton, Iowa. 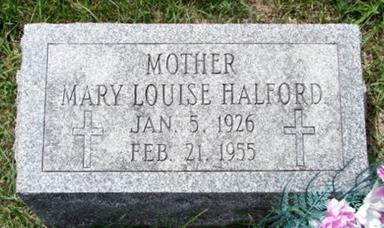 Mrs. Halford was preceded in death by her parents, Dallas and Lena (Ferguson) Floyd. Her husbands, Antone Thompson in 1968, Nelson Halford in 1992, and a brother, Donald Floyd. Funeral services were held at 1:30 p.m. Friday, November 30, 2001, in the Union Church in Quasqueton, Iowa…. Burial was held in the Circle Grove Cemetery, Walker, Iowa. Casket bearers were Casey Boyd, Quint Easter, Jeffrey Oliphant, Steve Saunders, Douglas Thompson, and Robert Thompson. Honorary casket bearers were Dennis Chavetz, Randy Maas, Phil Oliphant, Greg Schmelzer and Robert Schmelzer. AAFA NOTES: SSDI records show that Esther M. Halford (SS# issued in IA) was born 26 May 1923. See the obituary of her third husband, Nelson Ralph Halford, in this compilation. SIOUX CITY, IA—Services will be held Thursday at 2 p.m. for Eugene D. Alford, 49, Sioux City fruit and vegetable broker who died Tuesday. Mr. Alford, a war veteran, came to Sioux City from Omaha 14 years ago. AAFA NOTES: We included the obituary of his daughter-in-law Marjorie Julia Darby Alford in Kansas Obituaries. From California, Marriage Records from Select Counties, 1850-1941 (Ancestry): Eugene Davis Alford, age 29 born about 1895 in KS, married Christina Virginia Ward, age 27 born MO, on 24 May 1924 in Alameda Co., CA. 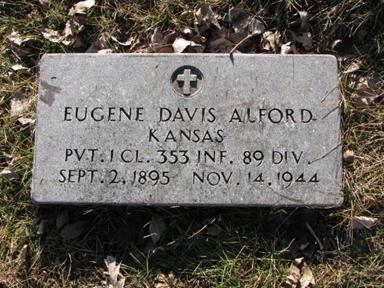 Eugene was the son of David R. Alford and Mary Davis. Christina was the daughter of George C. Ward and Anna Coldsnow. His lineage: Eugene Davis 1895 KS1, David Robert 1867 KS2, Henry 1819 England3. Eva Lee Mack, 83, of Ames, Iowa, died Monday at Mary Greely Hospital in Ames. Funeral arrangements are pending at Merle Hay Mausoleum Mortuary in Des Moines, Iowa. A memorial service will be in Beaumont at a later date. A native of Italy, Texas, she has lived in Beaumont 75 years before moving to Ames five years ago and was a former executive housekeeper for The Ridgewood in Beaumont. Survivors include a daughter, Margaret Ann Cavett of Ames; brothers, Jasper Alford of Silsbee and Jack Alford of Beaumont; two grandchildren; and a great-grandchild. Memorial contributions may be made to the United Senior Citizens Center in Ames. AAFA NOTES: SSDI records show that Eva L. Mack (SS# issued in TX) was born ,18 Oct 1906, last residence not listed. We included the obituary of her brother Jasper Newell Alford, Jr., in Texas Obituaries; and her grandfather Nelson Ellis Alford in Arkansas Obituaries. Eva’s father, Jasper Newell Alford, was born 18 Sept 1883 in Gibson Co., TN, and died 3 March 1951 in TX. He married Mamie Evie White 25 Dec 1905 in Ellis Co., TX. Her lineage: Eva Lee 1906 TX1, Jasper Newell 1882 TN2, Nelson Ellis 1853 TN3, John William 1825 TN4, George Washington 1794 VA5, John 1760 VA6, William 1738 VA7, John 1696 ??8. Frank H. Alford, 816 East Thirteenth street, prominent member of Davenport lodge. No. 298, B.P.O. Elks, and a veteran of the Spanish-American war, died of hemorrhage last night at 10 o’clock at St. Luke’s hospital, where he had been rushed from the Elks club on Fourth street after suffering an attack. The decedent had dropped in at the club last evening as was his wont and about 9:30 o’clock he complained of feeling ill. J.C. Minett, Ed Niemand and Julius Brandt, who were at the club at the time, accompanied him around the block for a walk and when they reached the Davenport hotel he suffered an attack of hemorrhage. The three men rushed him back to the club and Dr. C.E. Block was called. He was taken immediately to St. Luke’s hospital in the ambulance, where he died 30 minutes later. The hemorrhage was thought to be the result of a fever Mr. Alford contracted in Jacksonville, Fla., in 1898 when he was serving with the American army during the Spanish-American war. 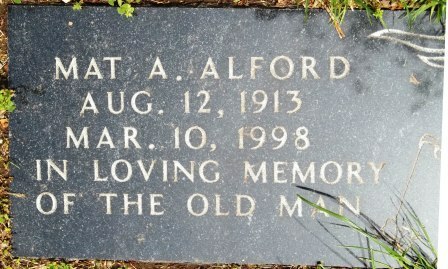 Mr. Alford was born on Oct. 19, 1876 in Davenport and had lived here continuously. He received his education in local schools. Early in his life he was employed as a steamboat pilot on the Mississippi river and later had charge of an agency for Ford trucks. During the war he was employed at the arsenal and his last position was inspector for the state highway commission. The decedent was an active member of the Elks and was extremely popular because of his unusually pleasing personality. He belonged to the Edwards Congregational church. Surviving are his mother, Mrs. Mary Alford of Davenport and one brother, William, also of this city. Funeral services will be held tomorrow afternoon at 3 o’clock at the Elks club rooms. Interment will be in Oakdale cemetery. AAFA NOTES: See the obituaries of his parents, Henry Alford and Loretta Little Alford; brother William Davis Alford; and his stepmother Mary Little Alford in this compilation. His lineage: Frank Henry 1876 IA1, Henry 1840 England2, William 1816 England3. MASON CITY—Harold E. Alford, 79, died Friday (Feb. 2, 2001) at Muse Norris Hospice Inpatient Unit, Mason City. A private graveside service will be held Monday at Blairsburg Cemetery, Blairsburg. Cataldo Funeral Home, Garner, is in charge of arrangements. 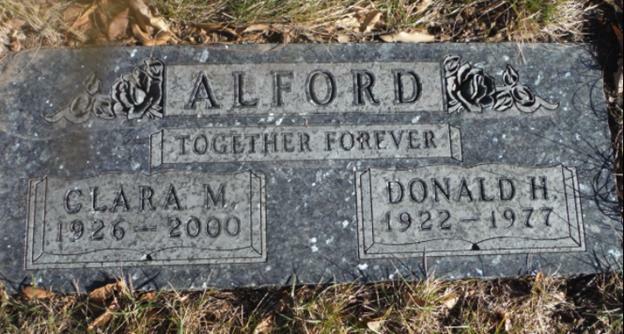 Harold Edward Alford, the son of Adolphus Edison and Pearl (Fowler) Alford, was born May 17, 1921, at Williams [Hamilton Co.], Iowa. At an early age, he moved with his family to Blairsburg where he attended school. He then moved to California where he was in sales. Harold spent most of his life in California and Las Vegas, Nev., before moving back to Iowa and working at O’Brien Moving and Storage Company in Mason City. He enjoyed traveling and playing music on the guitar and piano. Harold is survived by four nephews, Byron Stromer and his wife, Millie, of Garner, Val Stromer and his wife, Millie, of Slater, Velere Stromer and his wife, Juanita, of Klemme, and Lyndon Stromer and his wife, Jeanne, of Denver, Colo.; and two special long-time friends, Edna Ryan and Lillian Jacobson, both of Mason City. He was preceded in death by his parents; a brother, Morris Alford; and a sister, Verna Stromer. AAFA NOTES: SSDI records confirm the birth and death dates of Harold E. Alford (SS# issued in IA), last residence Mason City, Cerro Gordo Co., IA. His lineage: Harold Edward 1919 IA1, Adolphus Edison 1882 NY2, Leslie 1855 NY3, Ransom Constantine 1818 VT4, Ashley Owen 1770 VT5, Benedict 1716 CT6, Benedict 1688 CT7, Jeremiah 1655 CT8, Benedict 1619 England9, Thomas 1598 England10. Harry D. Alvord, 69, of 2404 Richland Drive, died Wednesday at Mercy Hospital Medical Center of injuries suffered in a car-pedestrian accident last Thursday at Avenue Frederick M. Hubbell and Wisconsin Avenue. Services will be at 10:30 a.m. Friday at the Grandview Funeral Home. Burial will be at Highland Memory Gardens. Mr. Alvord was born in Mitchellville [Polk Co.], but spent the last 60 years in Des Moines. He was retired from the VanDyke Furnace Co. where he was a bookkeeper and office manager. He was a member of the Highland Park Presbyterian Church. Survivors include his wife, Thelma; three sons, David, Mark and Gary all of Des Moines; a sister, Mary King of Des Moines; a brother, Vernon of Ashville, N.C., and two grandchildren. AAFA NOTES: SSDI records show that Harry Alvord (SS# issued in IA) was born 27 Oct 1910 and died _____ Feb 1980, last residence Des Moines, Polk Co., IA. See the obituaries of his wife, Thelma Irene Bennett Alvord; son David Jon Alvord; parents, Harvey Clyde Alvord and Cornelia Ann DeVotie Alvord; and siblings Catherine M. Alvord McCurnin, Mary Esther Alvord King and William Paul Alvord in this compilation. 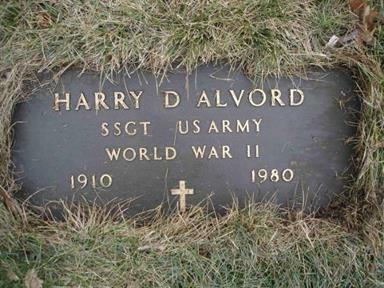 His ALVORD lineage: Harry D. 1910 IA1, Harvey Clyde 1879 IA2, William Brewster 1855 NY3, Sylvester Dudley 1810 NY4, Elijah 1774 CT5, Daniel 1742 CT6, Thomas 1710 MA7, Thomas 1683 MA8, Thomas 1653 CT9, Alexander 1627 England10, Thomas [ALFORD] 1598 England11. Harry Alford died Saturday evening at 7 o’clock at the home of his parents, Mr. and Mrs. Charles Alford, 514 west Sixteenth street. The deceased would have been 19 years or age March 23, and had been a telegraph operator at Worthington, Minn., until last fall when he was compelled to return home. He was born in Buffalo, this county, but had resided in Worthington since he was 7 years of age. Besides his parents he is survived by two brothers, Clarence, a telegraph operator in Minneapolis, and Benjamin, at home. Harry J. Alford, 19 years of age, son of Mr. and Mrs. Chas. Alford, 514 West Sixteenth street, Davenport, died Saturday evening at the home of his parents. He was a telegraph operator at Worthington, Minn., and came to Davenport on account of sickness last fall, and had since been unable to return to his work. The funeral services will be held at the family residence Tuesday afternoon at 1 o’clock, with interment at Buffalo, Iowa. 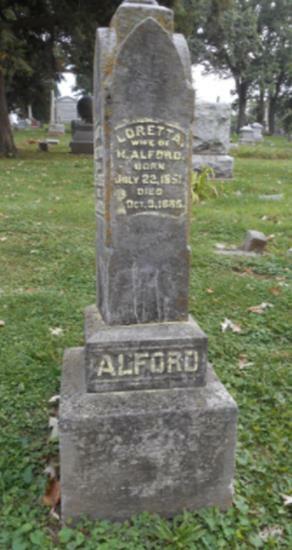 Mr. Alford was born in Ollie [Keokuk Co.], Iowa. When 2 years of age he removed with his parents to Worthington. He was a member of the Modern Woodmen of America. Besides his parents he is survived by two brothers, Clarence, of Minneapolis, Minn., and Benjamin, of Davenport. AAFA NOTES: See the obituaries of his parents, Charles H. Alford and Julia Johnson Alford; and brothers Benjamin Boise Alford and Clarence E. Alford in this compilation. 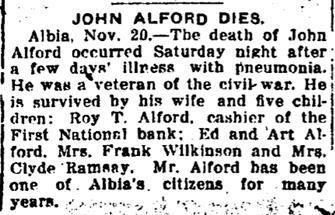 We included the obituary of his brother Alma W. Alford in Minnesota Obituaries. His lineage: Harry J. 1885 IA1, Charles H. 1849 IA2, William 1816 England3. Harvey Clyde Alvord was born May 3, 1879 in Iowa county and passed away September 9, 1959. He was married in 1902 to Cornelia Ann DeVotie. To this union were born seven children, Mrs. Catherine McCurnin, Mitchellville; Mrs. Mary King, Harry Alvord, Paul Alvord, all of Des Moines, Vernon Alvord, Kansas City, Missouri; also 12 grandchildren and 13 great-grandchildren. Services were held Thursday, September 10, at the Methodist church in Mitchellville with Rev. Viney officiating. Burial was in the Mitchellville cemetery. AAFA NOTES: See the obituaries of his wife, Cornelia Ann DeVotie Alvord; and his children Catherine M. Alvord McCurnin, Harry D. Alvord, Mary Esther Alvord King, and William Paul Alvord in this compilation. Harvey was the son of William Brewster Alvord and Katherine Fields. He died in Clarinda, Page Co., IA. His ALVORD lineage: Harvey Clyde 1879 IA1, William Brewster 1855 NY2, Sylvester Dudley 1810 NY3, Elijah 1774 CT4, Daniel 1742 CT5, Thomas 1710 MA6, Thomas 1683 MA7, Thomas 1653 CT8, Alexander 1627 England9, Thomas [ALFORD] 1598 England10. AAFA NOTES: See the obituaries of his first wife, Loretta Little Alford; his second wife (Loretta’s sister), Mary Little Alford; sons Frank Henry Alford and William Davis Alford; mother, Eliza Jago Alford Langworth Ladner, and brothers Charles H. Alford and Elisha D. Alford in this compilation. We included the obituary of his brother William E. Alford in Missouri Obituaries. 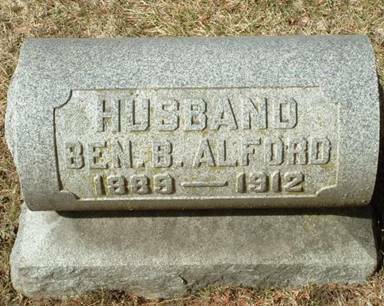 From Iowa, Marriage Records, 1880–1940 (Ancestry): Henry Alford, age 45 born England, son of Edward Alford and Eliza Ladner, married May Little, age 39 born in Davenport, IA, daughter of Samuel Little and Salome Hall, on 17 Nov 1886 in Scott Co., IA. It was Henry’s second marriage and May’s first. His lineage: Henry 1840 England1, William 1816 England2. Another highly esteemed citizen of this place has gone. Mrs. Imogene Stanlnecker passed away Friday evening at 5:30 o’clock, after a long illness. Funeral services were held Monday afternoon at the Congregational church conducted by Rev. C.S. Baird, a friend and former pastor of the deceased…. Pall bearers were L.U. Harrison, F.D. Cherington, E.E. Kinkade, H.W. Kinkade, J.S. Rundlett and A.O. Cannon. Among those in attendance from elsewhere were: Mr. and Mrs. Gould, Marengo; Mr. and Mrs. W.S. Mills, Mrs. L.L. Goole, Mrs. L.M. Randolph, Mrs. Fred Hood and Gilbert Cox, Creston. Burial was made in Cromwell cemetery beside the husband and son, who preceded her in death. Imogene Alvord Stanlnecker was born at Mentor, Ohio, August 1, 1848. In early life she became a Christian and always followed closely in the steps of the Master. In her young womanhood she was a teacher, always remaining a reader, with an alert mind. She came here with her family in the 70’s and resided on a farm south of town for a number of years. The death of their only son, Luther, during these years, who had grown to young manhood and had a bright and promising future, came as a blow to both the father and mother, affecting their entire lives. Later they purchased them a peasant home and moved to town, where the husband. 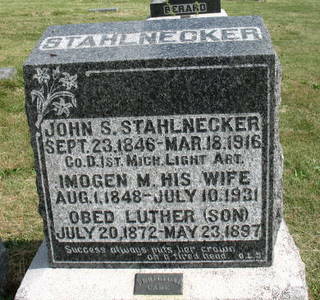 John S. Stahlnecker, passed away in 1916 and where Mrs. Stahlnecker remained until her death. We shall miss her. She was kind-hearted, a good neighbor and a worthy friend. Surviving her is one sister, Mrs. Estelle Wilkinson of this place, and a brother. Scott Alvord of Hagler, Arizona, besides other relatives and many friends. AAFA NOTES: Imogene, whose name is spelled Imogen on her gravestone, was the daughter of Obed Gool Alvord and Melissa Ann Talbott. His ALVORD lineage: Imogene Minerva 1848 OH1, William Brewster 1825 OH2, Elijah Johnson 1770 CT3, Obed 1744 CT4, Asahel 1720 MA5, Thomas 1683 MA6, Thomas 1653 CT6, Alexander 1627 England7, Thomas [ALFORD] 1598 England9. 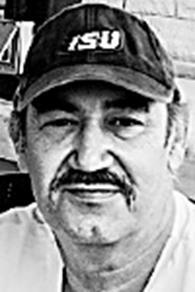 Ira J. Alford, 62, resident of this community many years, died Tuesday [March 26] at 5 A.M., at his home northwest of Villisca, Iowa, following a prolonged illness. The body was brought to the Sutphen funeral home to await the funeral service which will be held there, Friday at 2 P.M., conducted by the Rev. E.M. Buehler, assisted by the Rev. F.W. Thompson. Interment will be in the Villisca Cemetery. AAFA NOTES: See the obituaries of his second wife, Martha C. Enarson Alford; third wife, Esme V. Anderson Alford; and son Lee Ernest Alford in this compilation. From AAFA research: Ira Joseph Alford’s first wife was Myrtle Edith Copelin (1887-1928), the mother of his son Lee Ernest Alford. 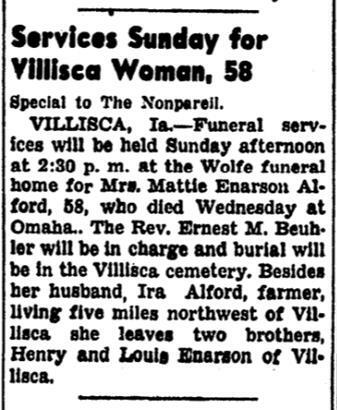 Ira’s second wife was Martha L. Enarson, whom he married 9 Dec 1917 in Villisca and who died 1 May 1940. He married his third wife 8 Oct 1941 in Nodaway Co., MO, but the marriage record says they were both from Montgomery Co., IA. 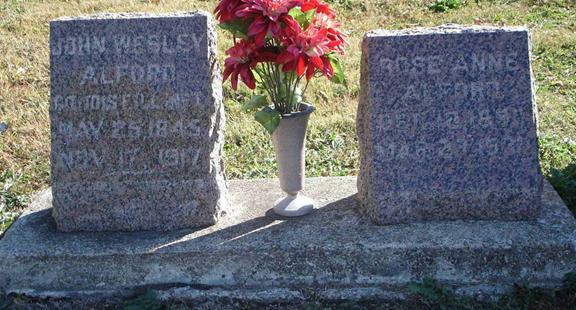 Ira’s parents, Charles Alford and Cecilia Emma Young, and his paternal grandparents, Carlos Alford and Rebecca Smith, are buried in Princeville Township Cemetery, Peoria Co., IL. His lineage: Ira Joseph 1883 IL1, Charles 1855 IL2, Carlos 1807 CT3, Moses 1783 CT4, Joseph 1748 CT5, Jonathan 1720 CT6, Jeremiah 1692 CT7, Jeremiah 1655 CT8, Benedict 1619 England9, Thomas 1598 England10. GEORGE, IA—James W. Alford age 54 of George, IA died Sunday, August 4, 2013 at the Sanford Hospital in Sioux Falls, SD. Funeral services will be 2:00 p.m. Wednesday, August 7, 2013 at the Jurrens Funeral Home in George, with Reverend Terry Simm officiating. Visitation will be Tuesday, August 6th from 4:00 p.m. to 8:00 p.m. with family present from 6:00 p.m. to 8:00 p.m. at the Jurrens Funeral Home in George. James Warren Alford was born on December 4, 1958, the son of Warren and Pocahontas (Cooper) Alford in Tahlequah, OK. James grew up in Keota, OK and attended school there. On August 8, 1986, James was united in marriage to Beth Lemke in Wagneer, OK. He lived and worked various places throughout his life such as, working on an oil rig in Alaska, welder in Oklahoma, IBP in South Sioux City, NE, Swift in Worthington, MN and most recently Sudenga in George, IA. He was a member of the First Presbyterian Church in Sibley, IA. James enjoyed fishing, bowling, playing darts, cards, riding motorcycle, watching movies with his kids and vacationing with his family. He was a kind hearted person, easy going and a good provider to his family and a big fan of the Tampa Bay Buccaneers and the Oklahoma Sooners. James is survived by his wife, Beth Alford of Sibley, IA; five children, Billy Warren of Texas, Kandice Alford of Sibley, IA, Amanda Alford of Inver Grove Heights, MN, Tabitha and Tanner Alford of Sibley, IA; two brothers, Eugene Alford of Stigler, OK and Kenneth Lowe of Kiefton, Oklahoma; sister, Linda Colwell of Stigler, OK; and aunts, uncles, nieces, nephews, cousins and other extended family. He was preceded in death by his parents, Warren and Pocahontas Alford; sister, Katherine Harmon; brother, Robert Lowe; paternal grandparents, Simm and Mary Alford; and maternal grandparents, Oscar and Madge Cooper. We included the obituary of his mother, Pocahontas “Pokey” Cooper Alford, in Oklahoma Obituaries. Janice Marie Alford, age 63, of Marengo, passed away at Marengo Memorial Hospital, July 2, 2017. Graveside services: 2:00 p.m., Tuesday, July 11, 2017. Burial will be in the Marengo Cemetery. Visitation: 12:30 to 1:30 p.m., Tuesday, July 11, 2017 at Kloster Funeral Home, Marengo, prior to the graveside service. Janice is survived by four children Shirley (Robert) Arends, Jeannie (Alfonso) Varella, Teresa Alford and Charlie (Angel) Alford; two sisters Kathy Haus and Sandra Hutson; 20 grandchildren and 18 great grandchildren. She was preceded in death by her parents and her husband Charles. Janice was born September 8, 1953, in Kansas City, Missouri, the daughter of Virgil and Irene McFadden Duncan. See the obituary of her husband, Charles Everett Alford, in this compilation. Jerry Alford, 40, of the 1800 block of East Park Avenue, died of a heart attack Thursday [April 5] at home. Graveside services will be held on Monday at Laurel Hill Cemetery. 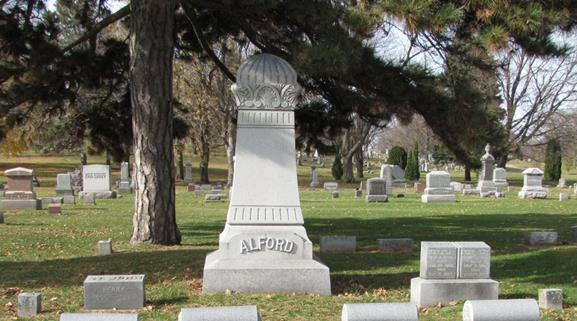 Mr. Alford was born in Denver, Colorado, and had lived in Des Moines most of his life. He was a supervisor with Integra ABM services. He is survived by his wife, Lisa Leonard; a son, Jerry III at home; a daughter, Stephanie Whitten of Des Moines; five brothers, Jim Todd, Charles Alford, Ronald Alford, and Earl Alford, all of Des Moines, and Donald Alford of Stuart; and three sisters, Betty Alford of Des Moines, Lillie Alford of Iowa City, and Shirley Stepp of Richmond, Kentucky. AAFA NOTES: SSDI records show that Jerry D. Alford (SS# issued in IA) was born 5 June 1960, last residence not listed. See the obituaries of his parents, Mat Arthur Alford and Mae Stepp Alford; and his siblings Betty S. Alford, Charles Everett Alford, and Earl Clyde Alford in this compilation. His lineage: Jerry D. 1960 CO1, Mat Arthur 1923 KY2, Charles 1892 KY3, Tarlton 1863 KY4, Daniel Lunsford 1830 NC5, John 1806 NC6, Achilles 1772 VA/NC7, John before 1750 VA8. Mrs. Julia Alford, a resident of Davenport for 35 years, died at Mercy hospital at 7 p.m. Monday following a two weeks’ illness. She had resided at 526 West Sixteenth street. 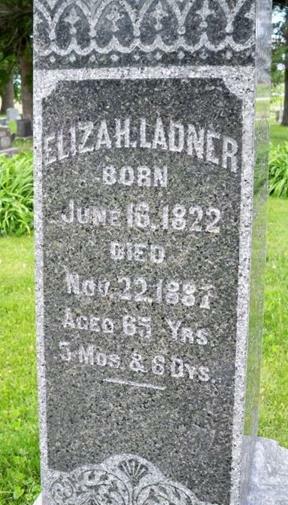 She was born in Wisconsin, April 13, 1853, and was married to Charles Alford. Mrs. Alford was a member of the Eastern Star of Verona, Mo. Surviving are a grandson, Vern Alford, of Davenport, and a granddaughter, Mrs. Romelle Cunniff of LaCrosse, Wis. Her husband and four sons preceded her in death. Funeral services will be held at the Runge mortuary at 10 a.m. Saturday. Services at the grave in Rose Hill cemetery, Buffalo, will be private. AAFA NOTES: See the obituaries of her husband, Charles H. Alford; and sons, Benjamin Boise Alford, Clarence E. Alford, and Harry J. Alford in this compilation. We included the obituary of her son Alma W. Alford in Minnesota Obituaries. Kathleen was preceded in death by her husband Arnold in 2001, her parents, her sister Berniece, her brothers: Lewis, Donald, Charles and Richard…. WINTHROP—Kathleen Halford, 91, died Thursday, Nov. 23, 2017. Services: 10:30 a.m. Wednesday, Nov. 29, at St. Patrick’s Catholic Church, Winthrop. Burial: Fairview Cemetery, Winthrop. Visitation: 3 to 7 p.m. Tuesday, Nov. 28, with a Scripture service at 7 p.m., and until 10 a.m. Wednesday at Fawcett Funeral Home in Winthrop. Survivors include her children, Dianne Halford of Houston, Texas, Glenda (Bud) Barrett of Traer, Colleen (Wayne) Venter of Dubuque, Randy (Sally) Halford of Texas, Patty (Craig) Cameron of Independence and Judy Halford of Oskaloosa; 10 grandchildren; and nine great-grandchildren…. See the obituary of her husband, Arnold Hayes Halford, in this compilation. A celebration of life service for Kay La Von Alvord, who passed away peacefully at home on Monday, May, 12, 2014 will be held 11:00 a.m., Saturday, May 17 at Caldwell Raddatz Funeral Home and Crematory in Urbandale. A visitation will be held two hours prior to services. Kay enjoyed playing bridge, traveling, golfing, reading and getting together with friends. She especially loved her dogs. Kay is survived by her sister, Jo (Jeff) Cox. She is preceded in death by her husband, David and brother, Dan Moore. 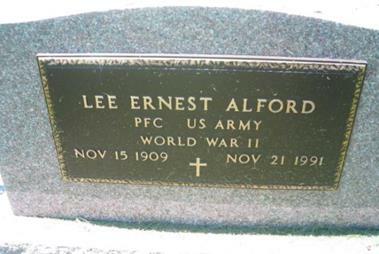 Services for Lee Ernest Alford, 82, Corning, Adams County, Iowa, were Saturday, November 23, 1991, at Coen-Beaty Funeral Home in Corning, Iowa. Joe Cook officiated and burial was in Villisca Cemetery, Villisca, Iowa, with military rites by Corning American Legion Ourcq Post #117 of which he was a life-time member. 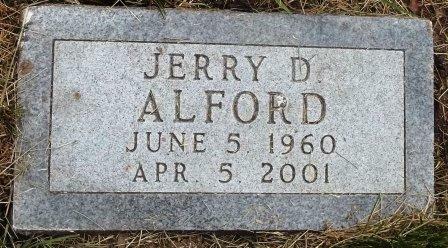 Mr. Alford died Thursday, November 21, 1991, at Mercy Hospital in Corning, Iowa. He was born November 15, 1909, in Washington Township, Montgomery County to Ira J. and Myrtle Copelin Alford, attended rural school in Montgomery County and graduated from Villisca High School in 1928. He married Verla Van Alstine in Maryville, Missouri, April 6, 1940. In 1939, he joined the Iowa National Guard and entered the U.S. Army, April 18, 1944, at Camp Dodge. He served during WW II in the European Theatre, Rhineland, Germany, and was discharged September 10, 1945, after being wounded in action in France. He worked in Villisca and Corning as a hog buyer for 26 years and worked at the Corning Post Office until retiring in 1975. He held a life-time membership in the American Legion, Veterans of Foreign Wars, and Disabled American Veterans. He was a member of Happy Hollow Country club, where he was an avid golfer. He was a member of the United Methodist Church. Memorials are suggested to Corning American Legion Scholarship Fund or Mercy Hospital Rose Ann Auxiliary. Survivors include his wife, Verla; two daughters, Judy Acinger and husband Frank of Plano, Texas and Janet Boswell and husband Dale of Corning; seven grandchildren; sister-in-law and brother-in-law, Jeanne and Clyde Copley of Austin, Minnesota; one niece, one nephew. AAFA NOTES: SSDI records confirm the birth and death dates of Lee E. Alford (SS# issued in IA), last residence not listed. See the obituary of his father, Ira Joseph Alford, in this compilation. His lineage: Lee Ernest 1909 IA1, Ira Joseph 1883 IL2, Charles 1855 IL3, Carlos 1807 CT4, Moses 1783 CT5, Joseph 1748 CT6, Jonathan 1720 CT7, Jeremiah 1692 CT8, Jeremiah 1655 CT9, Benedict 1619 England10, Thomas 1598 England11. After an illness only since Sunday Mrs. Lilla Alford, widow of Lore Alford, early-day lawyer and for many years a foremost advocate at the Black Hawk county bar, died at 6:45 p.m. yesterday at her home, 325 Franklin street. Her condition did not become critical until yesterday morning. She was conscious to the last and was surrounded by three of her six children, Mrs. Hubert Carr, Manchester: Dr. E.T. Alford, Waterloo, and Lore Alford, West Palm Beach, Fla., who arrived yesterday morning. Mrs. W.P. Powell, St. Petersburg, Fla., was on her way when her mother died. The two other children, Mrs. Lewis E. Johnson, Bethlehem, Pa., and Robert Alford, Brawley, Cal., were notified by telegram. Mrs. Alford was 77 years old. Lilla St. John, daughter of Elon and Julia B. St. John, who came to Waterloo in the late ’60’s was born at Arcadia, Wayne county, N.Y., Feb. 7, 1850. She came to Waterloo July 18, 1867, to be with a sister, Miss Della St. John, who was a teacher in the seminary on Park avenue and Wellington street, conducted by the Misses Field. Miss Della later was married to J.C. Gates. 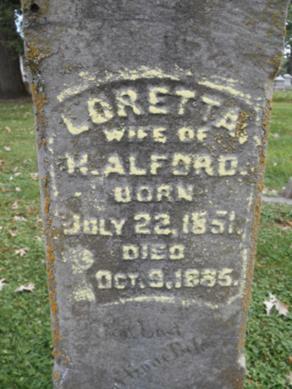 On March 29, 1871, she was married to Lore Alford in Chicago. He was a native of Maine and a soldier in the Civil war. She had lived in Waterloo ever since her first arrival here 60 years ago. 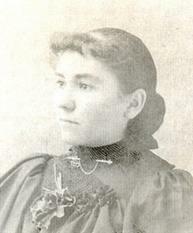 As a girl Mrs. Alford attended Cornell college at Mt. Vernon, Ia. The Alford home has always been a center of hospitality and culture. Mr. St. John, the father, died here in 1893 and the mother in 1894. 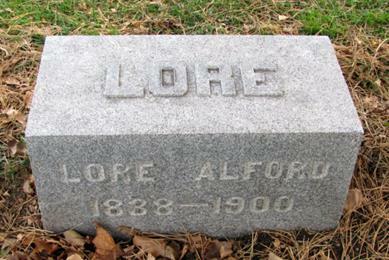 Mr. Alford died March 30, 1900. Mrs. Alford had been a devoted member of the Methodist Episcopal church since girlhood. During her long residence in Waterloo she was affiliated with Grace church. She was a member of Waterloo Woman’s club, Chapter Z, P.E.O., and the Fortnightly club, and a charter member of the Happy Hour Needlework club. The members of all these organizations have repeatedly met in the Alford home and enjoyed the charm and grace of their host and hostess. Surviving besides the children are 12 grandchildren and three great-grandchildren. The body is at the O’Keefe & Towne funeral home pending arrangements for services. These today awaited word from relatives living at a distance. AAFA NOTES: See the obituary of her husband, Lore Alford, in this compilation. We included the obituaries of her daughter Louise Alford Powell in District of Columbia Obituaries; her son Robert Cushman Alford in California Obituaries; her sons Edward True Alford and Lore Alford in Florida Obituaries; and her daughter Mary E. Alford Johnson in Pennsylvania Obituaries. 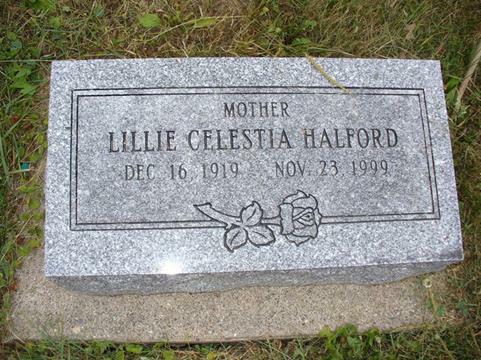 Lillie C. Halford, of Davenport, died Tuesday, Nov. 23, 1999, at Davenport Good Samaritan Center. Services will be 2 p.m. Friday at Runge Mortuary, Davenport…. Burial will be in Rose Hill Cemetery, Buffalo, Iowa. Mrs. Halford was a homemaker. Lillie Easter was born Dec. 16, 1919, in Gainesville [Ozark Co.], Mo. She married Birt Halford in 1946 in Rock Island [Rock Island Co]. He died in 1970. Survivors include daughters, Louetta Carlson, Davenport, Nancy Brentise, Davenport, Wonda Amoni, Buffalo, Iowa, and Susie Harrison, LeMars, Iowa; sons, Winston [Hathcock], Niangua, Mo., Gary, Yuma, Ariz., and Jerry, Davenport; 22 grandchildren; 32 great-grandchildren; six great-great-grandchildren; sisters, Mamie Lewis, Pasadena, Texas, and Deloris Stroud, Mountain Grove, Mo. ; and brothers, Reed Easter, Lebanon, Mo., Vandon Easter, VanZant, Mo., John Easter, Davenport, and Basil Easter, Matherville, Ill.
AAFA NOTES: SSDI records confirm the birth and death dates of Lillie C. Halford (SS# issued in IA). See the obituary of her second husband, Birt Franklin Halford, in this compilation. We included the obituary of her son Jerry Lester Halford in Missouri Obituaries. Her first husband was Archie B. Hathcock, 1913–1987. MANNING—Committal services were held at the Manning cemetery Monday for Mrs. Robert Halford, formerly of Manning and Jefferson. Funeral rites were held at Jefferson before the body was brought to Manning for burial. 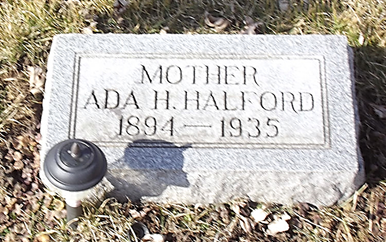 Mrs. Halford had been ill at her home in Merriam, Kan., about two months. She is survived by her husband, two sons and two stepdaughters. One son, Duane Halford, has been elected athletic coach at Sac City for the coming year. AAFA NOTES: See the obituary of her son Robert Duane “Dewey” Halford in this compilation. 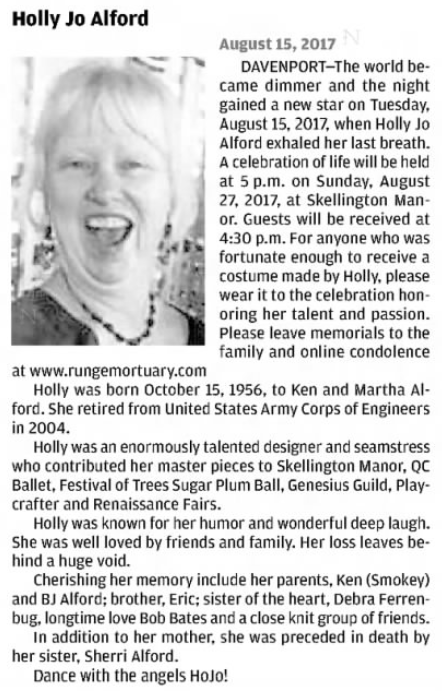 We included the obituary of her husband, Robert William Halford, in California Obituaries. 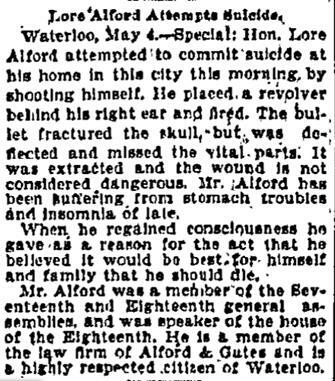 MINNEAPOLIS, Minn., March 30—A dispatch to The Journal from Waterloo, Iowa, says that ex-Speaker Love [sic] Alford of the Iowa House of Representatives committed suicide in his bathroom by cutting his throat with a razor. Failing health caused despondency. L. ALFORD OF WATERLOO, IA., FOUND DEAD WITH HIS THROAT CUT. WATERLOO, Ia., March 30—Former Speaker of the House Lore Alford was found dead in the bathroom of his home today with his throat cut. The body was in a kneeling posture with the head hanging over the bath tub into which the blood was spurting. Despondency over poor health is supposed to have been the cause for the act. Four years ago he attempted suicide by shooting, but recovered. Mr. Alford was a prominent lawyer and was Speaker of the Iowa House of Representatives during the Eighteenth General Assembly to 1880. 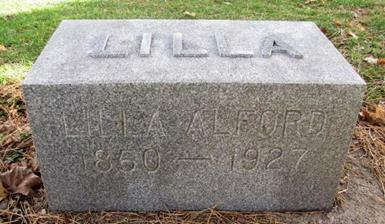 AAFA NOTES: See the obituary of his wife, Lilla St. John Alford, in this compilation. We included the obituaries of his daughter Louise Alford Powell in District of Columbia Obituaries; his son Robert Cushman Alford in California Obituaries; his sons Edward True Alford and Lore Alford in Florida Obituaries; his daughter Mary E. Alford Johnson in Pennsylvania Obituaries; and his brother Enoch L. Alford in Texas Obituaries. Numerous newspapers published nearly identical articles, all apparently from the same source and nearly all misspelling his name Love. It is not clear why the dateline is Minneapolis. 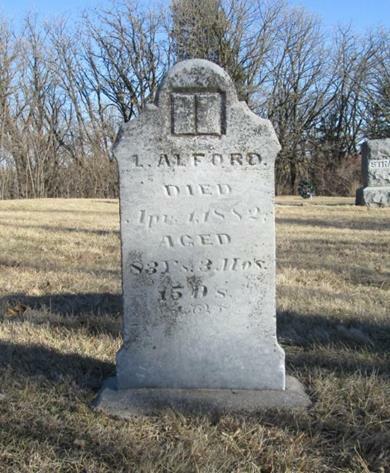 His widow, Lilla Alford, is listed on the 1940 census with 3 sons in East Waterloo, Black Hawk Co., IA. His lineage: Lore 1838 ME1, Nathaniel 1807 ME2, Deacon Lore 1766 CT3, Nathaniel 1738 CT4, Nathaniel 1688 CT5, Josiah 1649 CT6, Benedict 1619 England7, Thomas 1598 England8. AAFA NOTES: See the obituaries of her husband, Henry Alford; sons Frank Henry Alford and William Davis Alford; and sister (Henry’s second wife) Mary Little Alford in this compilation. Mae Alford, 62, 926 Oakridge Drive, died of a heart attack Tuesday [December 24] at home. Services will be at 9 a.m. Friday at Hamilton’s Funeral Home with burial in Kentucky. Mrs. Alford, a homemaker, was born in Booneville, KY, and lived in Des Moines for several years. 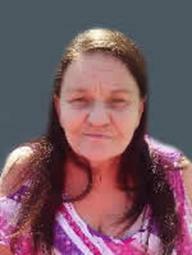 BOONEVILLE [Owsley Co.]—Mae Stepp Alford, 62, Des Moines, Iowa, formerly of Booneville, died there Tuesday. Her husband, Matthew, survives. Graveside service, 1 p.m. Sunday, Chestnut Gap Cemetery. Searcy & Strong Funeral Home is handling arrangements. AAFA NOTES: SSDI records show that M. Alford (SS# issued in OH) was born 12 May 1929 and died _____ Dec 1991, last residence Des Moines, Polk Co., IA. See the obituaries of her husband, Mat Arthur Alford; and her children Betty S. Alford, Charles Everett Alford, Earl C. Alford, and Jerry D. Alford in this compilation. Mae was the daughter of James Stepp and Elizabeth Barrett. MAXWELL, Jan. 4—Funeral services for Mrs. Margaret Goodnow, 86 years old, who died last Thursday in Blairsburg at the home of her daughter, Mrs. Sam Dunahoo, were held at the Evangelical church in Iowa Center Saturday. Mrs. Goodnow was a pioneer of Iowa Center, but had made her home with her daughter for some time. She leaves also three sons, Milton of Des Moines, Roy of Colo, and Eli of Algona. AAFA NOTES: Margaret was the daughter of James Halford and Mary Thomas. Her HALFORD lineage: Margaret Ann 1842 NY1, James 1817 England2. 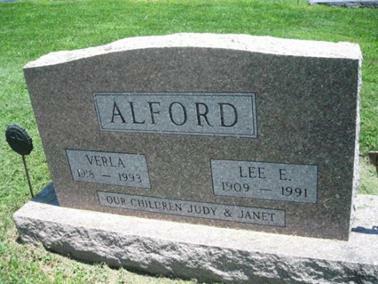 Mr. and Mrs. Lee Alford had word Wednesday night of the death of Mr. Alford’s stepmother, Mrs. Ira Alford of Villisca [Montgomery Co.]. 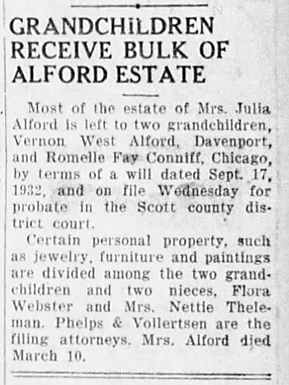 Mrs. Alford died in an Omaha [NE] hospital following an operation, which was the third operation she had undergone in an effort to save her life. Funeral services were held Sunday at Villisca and attended by Mr. and Mrs. Lee Alford and Mr. and Mrs. Glenn Van Alstine of Corning. AAFA NOTES: See the obituary of her husband, Ira Joseph Alford, in this compilation. BETTENDORF—Services for Martha J. “Marty” Alford, 68, Bettendorf, formerly of Blue Grass, Iowa, will be 3 p.m. Monday at Runge Mortuary, Davenport. Burial will be in Davenport Memorial Park…. 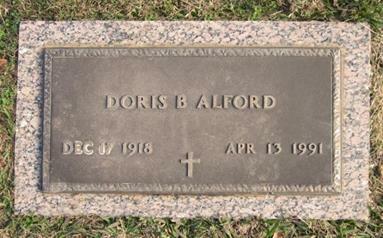 Mrs. Alford died Thursday, April 5, 2001, at Muscatine (Iowa) Care Center. She was employed as a realty specialist at the U.S. Army Corps of Engineers. Martha Curry was born Dec. 19, 1932, in Normal, Ill. She married Kenneth “Smokey” Alford in 1953 in California. Memorials may be made to Quad-City Diabetes Association or Scott County Humane Society. Survivors include a daughter, Holly Alford, Blue Grass; and brothers, David Curry, Minneapolis, and James Curry, Caledonia, Minn.
AAFA NOTES: SSDI records confirm the birth and death dates of Martha C. Alford (SS# issued in IA), last residence Blue Grass, Scott Co., IA. 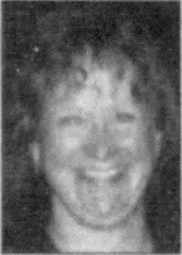 See the obituary of her daughter Sheri Joyce Alford in this compilation. 1940 census, Urbana, Champaign Co., IL: Martha J. Curry, age 7 born IL, is living with her parents, Loren B. and Marian S. Curry, and her brother Lawrence, David, and James. From California Marriage Index, 1949–1959 (Ancestry): Martha J. Curry, age 22, married Kenneth W. Alford, age 21, on 9 Apr 1955 in Orange Co., CA. 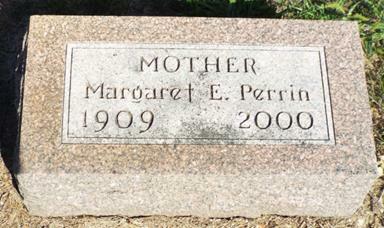 Her parents, Loren Bernard Curry (1890–1972) and Marion Stearns Curry (1896–1973) are also buried in Davenport Memorial Park. Mary E. King, 86, of Plymouth Place, 4111 Ingersoll Ave., died of a pulmonary ailment Friday [July 10] at Mercy Hospital Medical Center. Services will be at 10:30 a.m. Monday at Dunn’s Funeral Home. The body will be cremated following services. Mrs. King was born in Mitchellville and had lived in Des Moines most of her life. She was a retired medical transcriptionist at Veterans Medical Center, and had later worked at Des Moines General Hospital. AAFA NOTES: SSDI records show that Mary E. King (SS# issued in IA) was born 3 Apr 1906, last residence not listed. See the obituaries of her parents, Harvey Clyde Alvord and Cornelia Ann DeVotie Alvord; and siblings Catherine M. Alvord McCurnin, Harry D. Alvord and William Paul Alvord in this compilation. Mary was born 3 April 1906. She married Harold Michael King (1905–1953) on 28 Dec 1932 in Kansas City, Jackson Co., MO. Information on this family is from KingCasadyBartzAlvord Family Tree on Ancestry. More photos and the marriage certificate of Harold and Mary are also at that site. Her ALVORD lineage: Mary Esther 1906 IA1, Harvey Clyde 1879 IA2, William Brewster 1855 NY3, Sylvester Dudley 1810 NY4, Elijah 1774 CT5, Daniel 1742 CT6, Thomas 1710 MA7, Thomas 1683 MA8, Thomas 1653 CT9, Alexander 1627 England10, Thomas [ALFORD] 1598 England11. Funeral arrangements for Mrs. Mary Jean Halford, 22, of 622 Vermont street, are tentatively set for Wednesday afternoon in Winthrop, Ia., pending further word from her sister, Mrs. Margaret Lamson, en route here from Seattle, Wash. The body is at the Fawcett funeral home, Winthrop. Mrs. Halford died of complications following childbirth at 9:40 p.m. Saturday in Allen Memorial hospital, where she gave birth to a daughter, Judith Rae, 12 hours earlier. Born Aug. 17, 1922, in Winthrop, she was the daughter of Harry and Sarah Hickman; attended schools there and was graduated from business college in Cedar Rapids. She was employed in offices at the Rath Packing Co. here before her marriage to Second Lt. Arnold Halford on Oct. 24, 1942, in Missouri, and resided with him in Texas until returning to Waterloo last August to make her home with a sister; Miss Betty Jo Hickman. Surviving besides the husband, who arrived here Sunday from Camp Maxey, Tex., where he is stationed with the army anti-aircraft division, are the infant daughter; her parents; two sisters; two brothers, Pfc. Donald Hickman, with a medical detachment in Italy, and Robert, at Winthrop; and the paternal grandfather, James Hickman, Winthrop. AAFA NOTES: See the obituary of her husband, Arnold Hayes Halford, in this compilation. Mrs. Henry Alford, 83, mother of William D. Alford, former deputy county auditor, died at 7 a.m. today at her home, 816 East Thirteenth street, after a short illness of pneumonia. Mrs. Alford was born Mary Little in Little’s Grove, near Davenport, June 10, 1847, and was educated in the schools of Scott county and Davenport. She was married in 1884 to Henry Alford who died here in 1903. She was a member of Edward’s Congregational church and Silver Cross circle, King’s Daughters. Surviving are her son, William D. Alford of Davenport, and two nephews, Charles and John Thompson of Moscow, Idaho. The body was taken to Hill and Fredericks mortuary where funeral services will be held in the chapel at 2 p.m. Wednesday. Burial will be in Oakdale cemetery. AAFA NOTES: See the obituaries of her husband, Henry Alford; stepsons Frank Henry Alford and William Davis Alford; and sister (Henry’s first wife) Loretta Little Alford in this compilation. AAFA NOTES: See the obituary of her husband, Orel Lee “Whitey” Halford, in this compilation. Mat A. Alford, 74, of Guthrie Center died of a heart attack Tuesday [March 10] at Home. Graveside services will be at 2 p.m. Saturday at Laurel Hill Cemetery in Des Moines. Mr. Alford was born in Booneville [Owsley Co.], KY., and had lived in Des Moines several years before moving to Guthrie Center five years ago. He was a retired truck driver for the state of Indiana. AAFA NOTES: SSDI records do not list his death. The birth year on his gravestone is incorrect. See the obituaries of his wife, Mae Stepp Alford; and his children Betty S. Alford, Charles Everett Alford, Earl Clyde Alford, and Jerry D. Alford in this compilation. We included the obituaries of his father, Charlie Richard Alford; his brother Caleb V. Alford; and his half-sister Martha Jane Alford Reynolds in Kentucky Obituaries. Kentucky Birth Index, 1911–1999 (Ancestry) lists Mat A. Alford born 12 Aug 1923 in Bell Co., mother’s maiden name Lillie Warren. Also born in Bell Co. was Caleb V. Alford on 24 June 1925, mother’s maiden name Mae Warren. His lineage: Mat Arthur 1923 KY1, Charlie Richard 1892 KY2, Tarlton 1863 KY3, Daniel Lunsford 1830 NC4, John 1806 NC5, Achilles 1772 VA/NC6, John before 1750 VA7. SHEFFIELD—Family and friends are raising money to send a Sheffield woman’s body back to her hometown in Hawaii. Melissa Alford, 31, was killed when her car crashed into a grain truck at Lark Avenue and 210th Street on Friday morning. She is survived by two children. A longtime resident of Hawaii, Alford had been living in Sheffield since August. Alford’s mother, Deb Mertens, is raising money to bring her daughter’s body back to Maui, Hawaii. The family had about half of the $8,000 needed and is seeking the rest through the online fund-raiser, giveforward.com. As of 4 p.m. Monday, donors had given $3,200 of the $4,000 goal. The response touched Hirsch. “There still is some humanity left in this world of chaos,” he said. “It really warms my heart. Alford spent her early childhood in Georgia. At age 12, she moved to Hawaii with her mother. The fatal crash was still being investigated on Monday. Iowa State troopers said Alford was driving north on Lark Avenue and either failed to stop at a stop sign or failed to yield. She was hit by a westbound grain truck. The driver of the grain truck, Thomas Turek, 61, of Clear Lake, wasn’t hurt. Former co-workers of Alford’s at The Other Place in Clear Lake are organizing another fundraiser. Details are still being worked out. Merle M. Halford, 88, of Davenport, passed away Thursday, December 8, 2016 at Good Samaritan Nursing Center in Davenport. Funeral services will be held at 2:00 p.m. Thursday, December 15, 2016 in the Runge Mortuary Chapel…. Burial will be in Rose Hill Cemetery in Buffalo, IA…. Merle was born on January 16, 1928 in Topeka, KS, a son of Birt F. and Ada (Martin) Halford. He graduated from Buffalo High School, was an Army Veteran and was united in marriage to Ethel “Leoda” Welch in Galena, IL on September 12, 1962. She preceded him in death in 2000. He worked at LaFarge North American retiring in 1995 after over 40 years. He was a member of the Masonic Fraternal Lodge 221 and the Davenport American Legion Post 26. He was a former member of Maywood Baptist Church in Independence, Mo and previously active at the Palmer Center there. Merle loved fishing, vegetable gardening and enjoyed being with people. Church was very important to him along with his family and he always had a smile. Survivors include his brother, Gary (Maria) Halford; sisters, Nancy (Chester) Brentise, Wonda Amoni and Susan (Tim) Harrison along with several loving nieces and nephews who always thought he was special. He was preceded in death by his parents; wife and siblings Lathea, Orel, Opal and Jerry…. See the obituaries of his parents, Birt Franklin Halford and Ada Harriett Martin Halford; and siblings Opal Marie Halford Huber and Orel Lee “Whitey” Halford in this compilation. We included the obituary of his half-brother Jerry Lester Halford in Missouri Obituaries. From Iowa, Select Marriages Index, 1758–1996 (Ancestry): Orel Lee Halford married Mary Louise Maher on 20 Nov 1946 in West Liberty, Muscatine Co., IA. His HALFORD lineage: Merle 1928 IA1, Birt Franklin 1894 MO2, James Franklin 1858 TN3, William Luker 1835 TN4, John 1795 SC5. MUSCATINE, IA—Mildred H. Alford, 88, a resident of Lutheran Homes in Muscatine, formerly of Bettendorf [Scott Co.], died Friday, Nov. 16, 2001, at the care center. There will be no services or visitation. Bentley Funeral Home in Wilton is in charge of the arrangements. 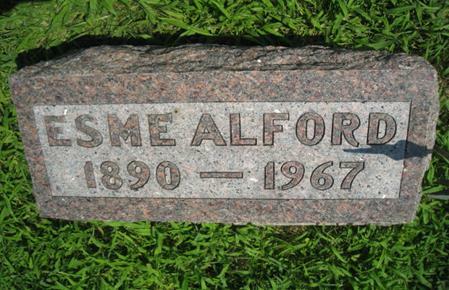 Mrs. Alford was born Sept. 14, 1913, in Redwing, Minn., the daughter of Emil and Minnie Meier. She married Vernon Alford in 1932 in Davenport. She worked at the Rock Island Arsenal in the payroll department, retiring in 1980. Previously she worked at the Army Corps of Engineers at the Arsenal. She enjoyed dancing, bicycling and traveling. Survivors include a daughter, Merry Howell and her husband, Thomas, of Moscow; a son, Kenneth ‘Smokey’ Alford and his wife, Bobbi Jo, of Los Cruces, N.M.; three granddaughters, Holly Alford, Julia Mullen Tharp and April Howell; two grandsons, Eric Alford and Tim Mullen; and three great-grandchildren. AAFA NOTES: SSDI records confirm the birth and death dates of Mildred H. Alford (SS# issued in IA). We included the obituary of her husband, Vernon Weston Alford, in Florida Obituaries. From Ancestry family trees: Mildred Helen Meier was the daughter of Emil H. Meier and Minene Cecilia Ast. INDEPENDENCE [Buchanan Co.]—Mildred S. Freebern, 72, of Independence, died at home Monday, Nov. 17, of natural causes; survivors include two daughters, Ruth Ann Smedley of Denver, Colo., and Teri McKinley of Woodbridge, Va.; two sons, Lee Roy of Cabot, Ark., and Rick of Olathe, Kan.; 15 grandchildren; eight great-grandchildren; a brother, Arnold Halford of Winthrop; and a sister, Margie Soules of Stanley; she was preceded in death by a son, Hal; and two brothers, Harland and Nelson Halford; services will be 10 a.m. Friday at Hope Wesleyan Church, Independence, with burial in Fairview Cemetery, Winthrop; friends may call anytime today at White Funeral Home, Independence; Ms Freebern taught school for a while, then became a secretary at the Mental Health Institute and at Hope Wesleyan Chruch, both in Independence, retiring in 1996. 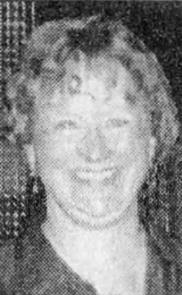 Mildred S. Freebern, 72, died of an apparent heart attack Monday, Nov. 17, 1997, in her home. Services: 10a.m. Friday, Hope Wesleyan Church, Independence [Buchanan Co.]. Burial: Fairview Cemetery, Winthrop. Friends may call after 7 tonight and anytime Thursday at White Funeral Home, Independence. Survivors include two daughters, Ruth Ann Smedley of Denver, Colo., and Teri McKinley of Woodbridge, Va.; two sons, Lee Roy of Cabot, Ark., and Rick of Olathe, Kan.; and a brother, Arnold Halford of Winthrop; and a sister, Margie Soules of Stanley. AAFA NOTES: SSDI records show that Mildred S. Freebern (SS# issued in IA) was born 28 Nov 1924, last residence Independence, Buchanan Co., IA. See the obituaries of her brothers Arnold Hayes Halford and Nelson Ralph Halford in this compilation. We included the obituaries of her paternal grandparents, Ashley Rozel Halford and Nancy Elizabeth Davis Halford, in Illinois Obituaries. Her HALFORD lineage: Mildred Shirley 1924 IL1, Roy Ralph 1896 IL2, Ashley Rozel 1870 IL3, [Ashley’s father unknown; he used his mother’s last name] Mary Francis 1848 IL4, Jonathan Adkinson 1800 NC5, John 1765 NC6, James 1737 NC7, John 1690 NC8, John 1640 NC9, Thomas 1614 England10. WINTHROP—Services for Nelson Halford, 72, will be 10:30 a.m. Saturday at Fawcett Funeral Home, Winthrop; burial in St. Patrick’s Cemetery, Winthrop, with graveside military rites by the Winthrop American Legion Post; he died Thursday (Dec. 22) at Mercy Hospital, Cedar Rapids, after a lengthy illness; survivors include his wife, Esther; a daughter, Brenda Strand of Grand Island, Neb. ; a stepdaughter, Rena Saunders of Davenport; four stepsons, James Mattern of Omaha, Neb., Gail Thompson of Quasqueton, Edwin Thompson of Winthrop and Norman Thompson of Cedar Rapids; five grandchildren, 12 stepgrandchildren and eight stepgreat-grandchildren; a brother, Arnold of Winthrop; and two sisters, Mildred Freebern of Rapid City, S.D., and Marjorie Soules of Stanley; he was preceded in death by his first wife, Leona, in 1967; and a brother, Harlan…. Mr. Halford served with the U.S. Army during World War II; he was a tiling contractor. AAFA NOTES: SSDI records show that Nelson R. Halford (SS# issued in IL) was born 1 Aug 1916, last residence Winthrop, Buchanan Co., IA. See the obituaries of his second wife, Esther M. Floyd Morris Thompson Halford; and siblings Arnold Hayes Halford and Mildred Shirley Halford Freebern in this compilation. We included the obituaries of his paternal grandparents, Ashley Rozel Halford and Nancy Elizabeth Davis Halford, in Illinois Obituaries. From SSACI: Nelson Ralph Halford was born 1 Aug 1917 [different than SSDI and gravestone], son of Roy R. Halford and Noi Hayes. His HALFORD lineage: Nelson Ralph 1916 IL1, Roy Ralph 1896 IL2, Ashley Rozel 1870 IL3, [Ashley’s father unknown; he used his mother’s last name] Mary Francis 1848 IL4, Jonathan Adkinson 1800 NC5, John 1765 NC6, James 1737 NC7, John 1690 NC8, John 1640 NC9, Thomas 1614 England10. Funeral Mass for Opal Huber was today at St. Mary’s Catholic Church in Iowa City…. Mrs. Huber, 67, of North Huber Liberty died Friday [October 11] at University Hospitals [Iowa City] from burns suffered in a household accident. Graveside services will begin at 10 a.m. Tuesday at Calvary Cemetery in Rock Island, Ill…. Mrs. Huber was born June 21, 1924, in Dora, Mo., daughter of Birdie and Cans [sic] Martin Halford. She married Bernard “Bernie” Huber Sept. 6, 1952, in Rock Island. They owned and operated Bernie’s Harley-Davidson in North Liberty. Mrs. Huber had been a North Liberty resident since 1952 and was a member of St. Mary’s Catholic Church. She is survived by her husband; two brothers, Merle Halford of Davenport and Orel Halford of Bettendorf; and eight nieces. AAFA NOTES: SSDI records confirm the birth and death (_____ Oct 1991) dates of Opal M. Huber (SS# issued in IA), last residence not listed. See the obituaries of her parents, Birt Franklin Halford and Ada Harriett Martin Halford; and brothers Merle Halford and Orel Lee “Whitey” Halford in this compilation. We included the obituary of her half-brother Jerry Lester Halford in Missouri Obituaries. From SSACI: Opal Marie Halford Huber was born 21 June 1924 in Dora, Ozark Co., MO, daughter of Bert F. Halford and Ada Martin. She died _____ Oct 1991. Her HALFORD lineage: Opal Marie 1924 IA1, Birt Franklin 1894 MO2, James Franklin 1858 TN3, William Luker 1835 TN4, John 1795 SC5. BETTENDORF—Services for Orel “Whitey” Halford, 77, of Bettendorf [Scott Co.], will be 10 a.m. Saturday at Our Lady of Lourdes Catholic Church, Bettendorf. Burial will be in Mount Calvary Cemetery, West Liberty, Iowa. Visitation is 5-8 p.m. today with a wake service at 7:30 p.m. at Runge Mortuary, Davenport. Mr. Halford died Wednesday, Feb. 26, 1997 at Genesis Medical, East Campus, Davenport. He retired in January 1982 after 32 years at Alcoa, Davenport Works. Orel was born Dec. 21, 1919 in Ozark County, Mo., to Bird [sic] and Ada (Martin) Halford. He married Mary Maher in April 1946 in Nichols, Iowa. During World War II he served in the Army. His hobbies included gardening, clocks and woodworking…. Survivors include his daughters, Diane (Mrs. John) State Sr., Rapids City, Ill., and Donna Lopez, Davenport; four grandchildren, Christine (Mrs. Mick) Webster and great-grandson, Ryan, Rapids City, Ill., John State Jr., Rapids City, Shannon Lopez, Davenport, and Justin Lopez, Davenport; a brother, Merle Halford, and his wife, Leoda, Davenport; half sisters, Nancy (Mrs. Chet) Brentice, Davenport, Wanda Amoni, Davenport, and Susan (Mrs. Tim) Harrison, LeMars, Iowa; half brothers, Gary Halford, and his wife, Maria, Yuma, Ariz., and Jerry Halford, of Oklahoma; and a special friend, Helen Anderson, Bettendorf. He was preceded in death by his wife, parents and two sisters, Leathea Yarrington and Opal Huber. AAFA NOTES: SSDI records confirm the birth and death dates of Orel L. Halford (SS# issued in IA). See the obituaries of his wife, Mary Louise Maher Halford; parents, Birt Franklin Halford and Ada Harriett Martin Halford; and siblings Merle Halford and Opal Marie Halford Huber in this compilation. We included the obituary of his half-brother Jerry Lester Halford in Missouri Obituaries. His HALFORD lineage: Orel Lee 1919 IA1, Birt Franklin 1894 MO2, James Franklin 1858 TN3, William Luker 1835 TN4, John 1795 SC5. WEST DES MOINES—Bob Alford, 88, passed away Thursday, October 22, 2009, at Iowa Methodist Medical Center. Bob was born on December 25, 1920, in Kansas City, Missouri to Freeman and Mary Alford. He had a great love for baseball and played for both the New York Yankees and Chicago Cubs systems. Bob served his country in the US Navy during WWII. He married Betty Mullin on January 9, 1943, in Washington, DC. In 1958, they moved to Windsor Heights where they made his home. Bob was an avid golfer at Des Moines Golf and Country Club. He was a member of St. Theresa’s Catholic Church, Kiwanis Golden K and Quarter Century Club at Equitable of Iowa. Bob worked in the Insurance Industry his entire career. Upon moving to Des Moines he started with Equitable of Iowa (ING) where he retired as Vice President of the Agency Department. Bob was preceded in death in 2006 by his wife of 63 years, Betty; his parents and his brother, Freeman. He is survived by a host of many friends. Visitation will be held from 9:30 to 10:30 a.m. Monday, October 26, at St. Theresa Catholic Church with funeral services at 10:30 a.m. Burial will be at Glendale Cemetery in Des Moines. Memorial contributions may be made to St. Theresa Catholic Church or the American Heart Association. AAFA NOTES: SSDI records confirm the birth and death dates of Robert Alford (SS# issued in MO), last residence West Des Moines, Polk Co., IA. See the obituary of his wife, Betty J. Mullin Alford, in this compilation. 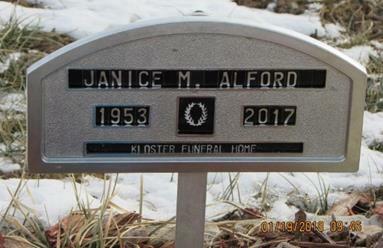 We included the obituaries of his sister Bettie Jane Alford in Missouri Obituaries; and of his brother Freeman Richard Alford in Texas Obituaries. He was the son of Freeman Fife Alford and Mary Elizabeth Jagars. His lineage: Robert A. 1920 MO1, Freeman Fife 1891 MO2, Robert Morrow 1848 MO3, Thomas 1818 VA4, James 1779 VA5, John 1732 VA6, John 1696 MD7. SPIRIT LAKE [Dickinson Co.], Iowa—R.D. “Dewey” Halford, 75, formerly of Sioux Falls, died Sunday, Oct. 16, 1994, at the Dickinson County Memorial Hospital, in Spirit Lake. Mr. Halford was born March 28, 1919, in Manning, Iowa. He was graduated from Jefferson High School in 1937. He received his bachelor’s degree from Morningside College in 1941. He taught and coached at Linn Grove, Iowa. He married Lavonne “Bonnie” Peterson on Oct. 25, 1942. He served in the Navy from 1942 to 1946. He then taught and coached for two years in Rock Rapids, Iowa, and seven years at Sac City, Iowa. He earned his master’s degree in 1950, from the University of Illinois. He became the head football coach at Morningside College in 1955, where he coached until 1973. He was also the athletic director from 1968 to 1973. He was appointed commissioner for the North Central Conference in 1977, and he moved to Sioux Falls. He served as commissioner until 1984, when he retired and moved to Spirit Lake. He earned all-NCC honors as a quarterback in 1940. He was named National Football Coach of the Year by the NAIA in 1956. He was a long-time official and starter for many high school and college events. 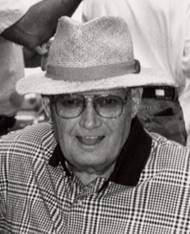 He was Honorary Referee for the Holstein Relays in 1976, and for the Sioux City and Howard Wood Relays, both in 1994. He was honored by Morningside College and the NCIAC with Meritorious Service Awards, and by the Sioux Falls Chamber of Commerce for outstanding contributions to athletes. He served on the Spaulding Football Advisory Staff; member of the United Methodist Church of Spirit Lake, where he was a former board member; Masonic Lodge and Scottish Rite; and board member of the YMCA Camp Foster of Okoboji, Iowa. He is survived by his wife, Bonnie; two daughters: Jill Haver of Wakonda; and Sue Harig of Arlington Heights, Ill; and five grandchildren. Services will begin at 10:30 a.m. Wednesday at the United Methodist Church in Spirit Lake, with burial at Laurens Cemetery, in Laurens [Pocahontas Co.], Iowa. Visitation will begin after 2 p.m. today at the Turner Funeral Home in Spirit Lake…. AAFA NOTES: SSDI records confirm the birth and death dates of Robert D. Halford (SS# issued in IA), last residence Spirit Lake, Dickinson Co., IA. 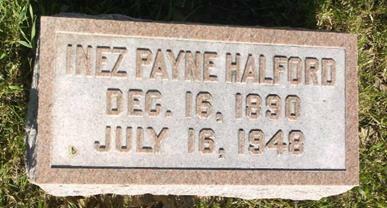 See the obituary of his mother, Lois Inez Payne Halford, in this compilation. We included the obituary of his father, Robert William Halford, in California Obituaries. From Iowa, Births and Christenings Index, 1800-1999 (Ancestry): Robert Duane Halford was born 28 March 1919 in Manning, Carroll Co., IA, son of Robert William Halford and Louise Inez Payne. From SSACI: Robert Duane Halford was born 28 March 1919 in Manning, Carroll Co., IA, son of Robert W. Halford and Inez Payne. His HALFORD lineage: Robert Duane “Dewey” 1919 IA1, Robert William 1886 IA2, James Henry 1850 NY3, James 1817 England4. Rufus Alford, about 69, 1211 Massachusetts avenue southeast, died at a local hospital Thursday morning, after a lengthy illness. He had been in the hospital for 12 days. Funeral services will be held at the Patterson funeral home Saturday at 2 p.m. with the Rev. J.M. Eaves of St. John’s Baptist church in charge. Burial will be in Elmwood cemetery. 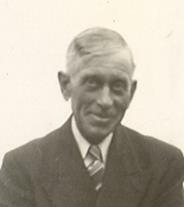 Mr. Alford- had lived in the same home for 23 years. He was born in the state of Mississippi and was employed by the Milwaukee railroad. Survivors include his wife. Birdie Alford, and two nieces and a nephew in Waterloo. He was preceded in death by a daughter, Mrs. Anna May Simmons. AAFA NOTES: See the obituary of his wife, Birdie Alford, in this compilation. Sheri Joyce Alford is dead. Her mother, Mrs. Martha Alford, a divorcee, is under heavy sedation. The child died in scalding water in a bath tub at the Alford home. Police said Mrs. Alford told them: “I thought it was the safest place in the house for her.” There was no crib for the child. Mrs. Alford had put some throw rugs in the tub as padding and covered them with a blanket. She said she put the baby in the tub, and then went upstairs with her 4-year-old daughter for a nap. When she awoke two hours later, Mrs. Alford said, she heard water running. She ran downstairs to find the tub full of scalding water and the baby dead. Police said there were signs the child had been playing and apparently had turned on the hot water faucet. The blankets probably stopped up the drain. AAFA NOTES: See the obituary of her mother, Martha Josephine “Marty” Curry Alford, in this compilation. Thelma Irene Alvord, 85, of Valley View Village, 2571 Guthrie Ave., died of a heart ailment there Wednesday. Services will be at 10 a.m. Saturday at Highland Park Presbyterian Church, of which she was a member and deacon. Burial will be at Highland Memory Gardens Cemetery. 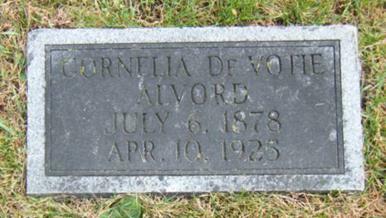 Mrs. Alvord was born in Hocking and had lived in Des Moines most of her life. She was a retired merchandiser with Ardan’s Jewelry and a volunteer with Valley View Village. She is survived by three sons, David of Urbandale, Gary of Des Moines and Mark of Ankeny; and two grandchildren. 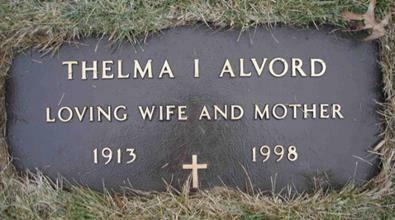 AAFA NOTES: SSDI records show that Thelma I. Alvord (SS# issued in IA) was born 26 Sept 1913. See the obituaries of her husband, Harry D. Alvord; and son David Jon Alvord in this compilation. From her Find A Grave memorial: Her parents were Frederick Orville Bennett and Rachael Ann Pilkington. SHELL ROCK [Butler Co.]—Thomas W. Alford, 43, passed away Saturday. There will be no visitation or services. Tom’s body has been cremated. Kaiser-Corson Funeral Home of Waverly, Iowa is assisting the family. Thomas W. Alford, 43, of Shell Rock and formerly from Liverpool, Texas passed away Saturday, February 2, 2008 at the Waverly Health Center in Waverly, Iowa. Tom was born on October 28, 1964 in Houston, Texas, the son of Keith and Kathleen (Hilzdendager) Alford. He attended school in Texas and graduated from Woodland High School in Woodland, Texas. Tom worked with his dad as a mechanic at their auto repair shop since he was 15 years old. In 2001, he took over the family business before closing the shop in 2002. In his younger years, Tom enjoyed speed racing boats. He also enjoyed spending time on the beach, drinking beer and patron, but most especially, spending time with his family and taking care of his mother-in-law, Judy. Survivors are his wife, Julie Alford of Shell Rock, Iowa; stepson, Austin Miller; his mother, Kathy Hilzdendager and her husband, Woody Skains of Liverpool, Texas; his dog, Missi; Kathy’s dog, Maggie Mae; mother-in-law, Judy Miller of Shell Rock, Iowa; grandmother, Iva Alford; sister, Angie Alford of San Antonio, Texas and niece, Kayla Alford. He was preceded in death by his father, Keith Alford; grandfather, Milton Alford and his maternal grandparents, Johnny and Lois Hilzdendager. There will be no visitation or services, Tom’s body has been cremated. Kaiser-Corson Funeral Home of Waverly, Iowa is assisting the family. 352-1187 Memorials may be directed to the family and online condolences may be left at www.kaisercorson.com. AAFA NOTES: SSDI records confirm the birth and death dates of Thomas W. Alford (SS# issued in TX), last residence Liverpool, Brazoria Co., TX. We included the obituary of his father, Keith Lanier Alford, in Texas Obituaries. Keith was born March 24, 1944 in Harris Co., TX, the son of Milton Lanier Alford and Iva Amanda Clarke, who married June 1, 1938 in Harris County, TX. Keith married Kathy A. Hilzendager on April 14, 1964. The family descends from the Julius Alford born 1717 VA.
Virginia Boling, 56, of 636 Twenty-second St., died of cancer Friday [April 5] at Broadlawns Medical Center. Services are pending in Austin, Ind. Mrs. Boling was born in Ohio and resided in Indiana most of her life and in Des Moines the past six years. She was a homemaker and was a member of Kingsway Cathedral. Dunn’s Funeral Home handled arrangements. AAFA NOTES: SSDI records show that Virginia Boling (SS# issued in IN) was born 20 Apr 1928 and died _____ April 1984. 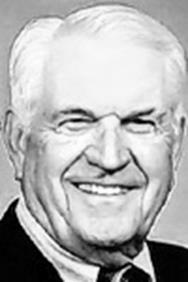 William D. Alford, 81, of Cedar Rapids, died Saturday, Feb. 16, 2008, following a brief illness. Born Feb. 4, 1927, in Fargo, N.D., to Ernest and Tressie Alford, he grew up on the Alford Guernsey Dairy Farm, which provided the foundation for a lifelong career in farm broadcasting (radio and TV) and sales. Bill served with the U.S. Army paratroops occupation forces in Japan after World War II. He then graduated from Iowa State University with a journalism degree. He was editor of the ISU Daily and named Most Likely to Succeed in his graduating class of 1951. His farm broadcasting career began at WOI-AM-FM-TV, and continued with the University of Massachusetts Extension Service and WLW Radio in Cincinnati. He is best remembered for his subsequent 24 years with WMT AM/FM/TV as a popular farm broadcaster and farm editor. Bill is a member of the WMT Radio Hall of Fame. He earned national prominence as president of the Iowa chapter and also as national president of the National Agri-Marketing Association. He was elected as Chairman of the Associates of NAFB (National Association of Farm Broadcasters). After leaving WMT, Bill was agribusiness director of Blair Radio and was later affiliated with Frank Magid & Associates. His love of golf continued into retirement and he greatly enjoyed working as a starter and ranger at Twin Pines Golf Course. Bill is survived by his wife of 57 years, Marilyn Larson Alford, and three daughters: Linda Fritts and husband, Jack, of Cedar Rapids, Amy Nakai of Plymouth, Minn., and Susan Boeckmann and husband, Neal, of Cedar Rapids. His four grandchildren are Lisa (David) Kesse, Jessica Fritts, David Nakai and Andrea Nakai. Also surviving is his stepmother, Verna Alford. Visitation and funeral services are pending at Cedar Memorial. Burial will be at a later date in Callender (Iowa) Cemetery. Memorials to the Dennis and Donna Oldorf Hospice House of Mercy or Camp Courageous would be greatly appreciated. William D. Alford: Services, 1 p.m. Tuesday at Cedar Memorial Park Chapel of Memories. The Rev. Herbert Isenberg will officiate. Burial: noon Wednesday at Callender Cemetery, Callender, Iowa. Friends may call at Cedar Memorial Park Funeral Home from 4 to 7 p.m. today. In lieu of flowers, memorial donations may be given to the Dennis and Donna Oldorf Hospice House of Mercy or to Camp Courageous in Bill’s name. Please leave a message or tribute to the Alford family on the Web page www.cedarmemorial.com under obituaries. AAFA NOTES: SSDI records confirm the birth and death dates of William D. Alford (SS# issued in ND). William D. Alford, 87, of 816 E. 13th St., Davenport, was pronounced dead on arrival Thursday at Davenport Osteopathic Hospital. Services will be at 1 p.m. Saturday in Hill & Fredericks Mortuary, Davenport. Graveside services will be conducted by Davenport Lodge No. 37, AF & AM, at Pine Hill Cemetery…. Mr. Alford was employed in the Scott County Auditor’s office 23 years. Prior to that, he had been employed as deputy assessor at city hall for five years and by the Rock Island Arsenal 12 years. He was a 63-year member of the Elks Lodge No. 298. He was active in masonic organizations including Lodge No. 37, the Davenport Consistory and the Kaaba Temple Shrine. Mr. Alford is survived by several cousins. AAFA NOTES: See the obituaries of his parents, Henry Alford and Loretta Little Alford; brother Frank Henry Alford; and his stepmother Mary Little Alford in this compilation. His lineage: William Davis 1882 IA1, Henry 1840 England2, William 1816 England3. Alvord, William, 58, of 3114 S.W. Twelfth Place, died Saturday at Merry Hospital. Alvord—Services for William P. Alvord, 3414 Southwest Twelfth Place, will be 1 P.M. Tuesday at the funeral home. Interment Sunset Memorial. Arnold’s Highland Park Funeral Home. AAFA NOTES: SSDI records show that William Alvord (SS# issued in IA) was born 9 Sept 1913 and died _____ March 1972, last residence not listed. See the obituaries of his wife, Anna C. Rasmussen Alvord; parents Harvey Clyde Alvord and Cornelia Ann DeVotie Alvord; and siblings Catherine M. Alvord McCurnin, Harry D. Alvord, Mary Esther Alvord King in this compilation. He served in WWII in Company A 810 Signal Service Battalion. His ALVORD lineage: William Paul 1913 IA1, Harvey Clyde 1879 IA2, William Brewster 1855 NY3, Sylvester Dudley 1810 NY4, Elijah 1774 CT5, Daniel 1742 CT6, Thomas 1710 MA7, Thomas 1683 MA8, Thomas 1653 CT9, Alexander 1627 England10, Thomas [ALFORD] 1598 England11.